You know the old trope, “write what you know”. And most of the time, the things closest to you are too close to notice. There are those things that you do and see every day, and you’re too familiar with them to even notice what they are anymore, let alone that they might be special or interesting outside of your narrow view of them. So it is with this salad. It’s so stupidly simple, I’m almost embarrassed to tell you about it. But I eat it nearly every day with dinner, I adore it, and I thought I should probably mention it sometime. 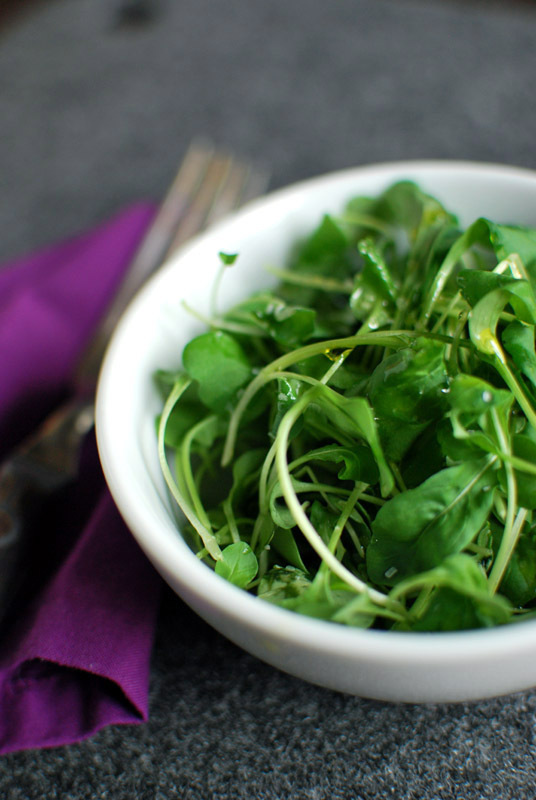 It’s three ingredients: arugula, olive oil, salt. And, as is the case with such simple food, the quality of each of those is important. But don’t let that hold you back. I’ve made this salad with some seriously on-the-way-out arugula, all fainting and half-yellow, and the cheapo olive oil I cook with. It was fine. Was it better with the aquaponically-grown hyper-local arugula, and the Very Special and Very Pricey olive oil in the tiny bottle? Of course. But y’all, it’s just salad. Let’s not overthink things. We’re all using Kosher salt, yes? Lovely. Do you happen to have some sort of fancy-pants special salt, from some exotic provenance? Maybe something flavored? Even better. I’d avoid table salt, though; it tastes a little… dirty, somehow. There is no vinegar in this salad. You can add some if you feel awkward eating an acid-less salad, but I prefer it without. Stupid. Simple. It’s my favorite. Do you really need a recipe? Here. 2. 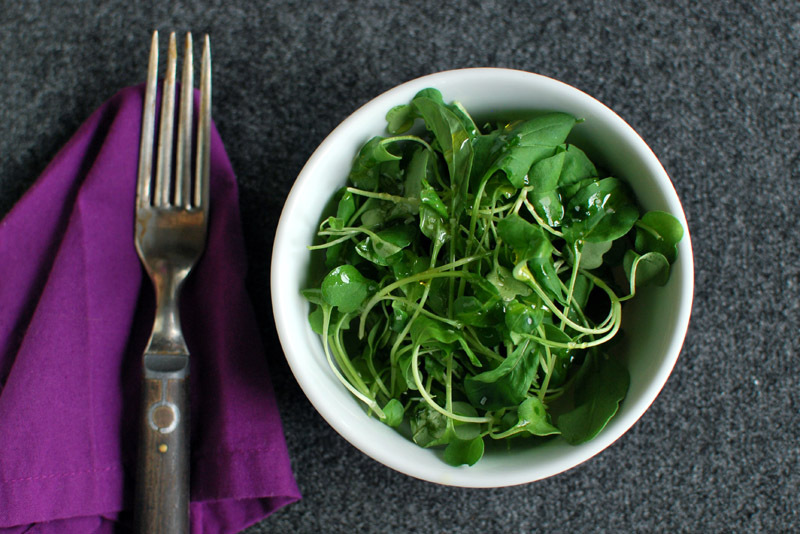 Put the arugula in the bowl. 3. Put some olive oil on the arugula. 4. Put a pinch of salt on top. In my line of work, I always seem to have random bits and bobs knocking around in my fridge. 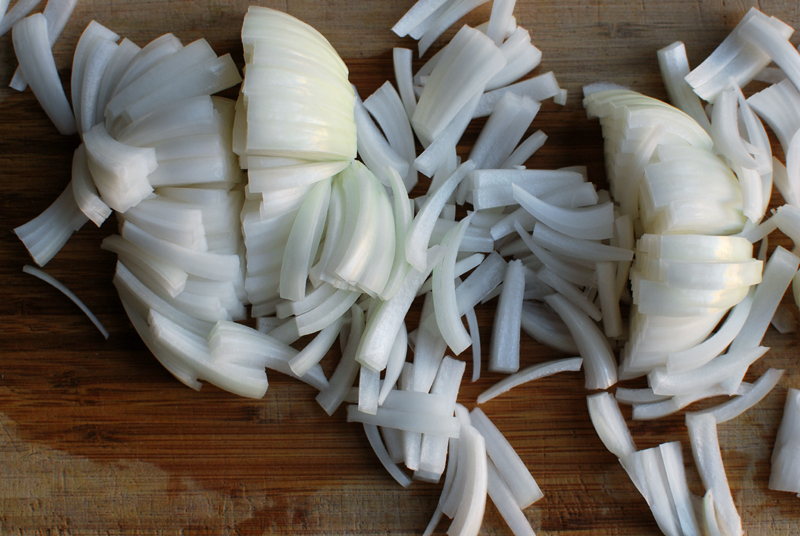 It’s half a chile here, a wedge of onion there, sometimes a handful of chopped kale. 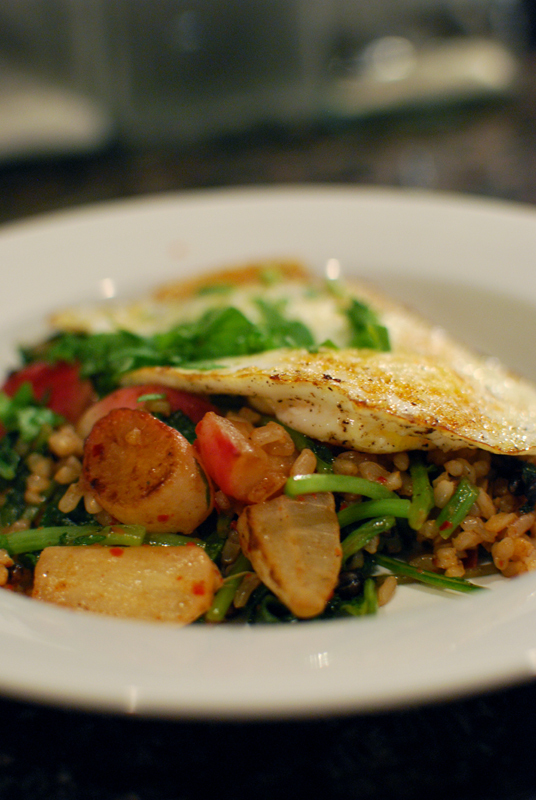 Dinner, therefore, mostly ends up being a rough jumble of ingredients tossed together on a sauté pan and a prayer. Mostly, it works out well enough. But every so often, I come up with something truly special. This is as sad as it is delightful, as I’m certain I will never ever ever enjoy that particular dish again, because that combination of ingredients will never again exist simultaneously in my fridge. Sometimes, though, it’s so good that I write it down. You know, just in case magic happens and those ingredients appear in my fridge. Who knows, I might buy those ingredients together on purpose. I took one bite of this, and immediately grabbed my pen and notebook. Here, it’s served with leftover mustard-roasted leg of lamb, just a few slices for an accent, because I had some in the fridge. It’s just as good on its own. The one ingredient that I'm certain you don't have is the smoked turkey glace, which sounds a lot fancier than it actually is. It's my secret ingredient lately; I'm stirring a spoonful into just about everything, and it. is. incredible. Get you one smoked turkey wing or leg, put it in your biggest stock pot with half an onion and a bay leaf, fill the pot mostly full with cold water, and bring just to a boil. Reduce the heat and simmer uncovered for about 1 hour, or until the meat comes easily off the bone. 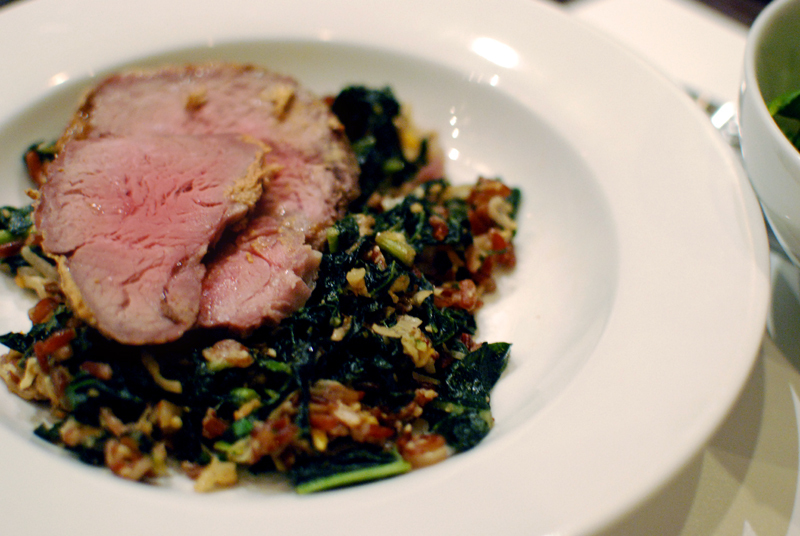 Remove the onion, bay leaf, and meat; use the meat for something delicious. Bring the stock back up to a boil and reduce the hell out of it. This might take several hours, but it's well worth it. Reduce it until there's hardly anything left, maybe 1/2 or 1 cup, tops. This is your smoked turkey glace. Cool it and store it in the fridge where you can get at it easily. It should thicken into a soft gelatin after chilling, but will dissolve instantly in any heat. Use in small amounts, and often. Or, you know, use chicken stock. Whatever works for you. 1. Heat a large sauté pan over medium high heat. Add a splash of olive oil, and sauté the garlic, shallot, and red onion for about 1 minute, or until fragrant and just beginning to soften. 2. Add the kale, and toss to combine. Reduce heat to medium. Splash in some dry vermouth, and cook until the kale has wilted down and no more liquid remains, 2-3 minutes. 3. Thin the cashew butter with enough water to make a runny sauce, and add it to the kale along with the smoked turkey glace. Stir until kale is coated, and cook until liquid has mostly evaporated. 4. 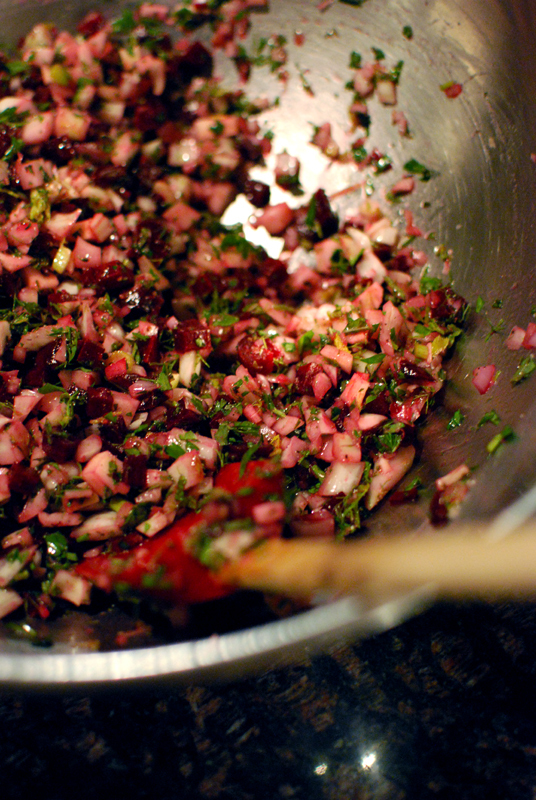 Add the cooked grain, herbs, preserved lemon (or lemon juice), and chile, and toss to combine. Remove from heat, and serve immediately with Parmesan grated generously over the top. My oh my, I haven’t given you all a recipe in ages, have I? Poor darlings, here you go. Over dinner the other night, I helped a dear friend brainstorm ideas for her family’s Christmas feast. They planned on salmon, but needed ideas for something festive to dress it up. Fennel immediately sprung to mind, in a sort of raw relish, with a heavy dose of lemon. Which would be, you know, okay, but it’s not good enough. Not for Christmas. A quick google didn’t turn up exactly the soignée dish I had in mind, just page after page of fennel and cucumber summat-er-other. I wasn’t inspired at all until one word caught my eye: beets. Yes! Beets! Fennel and beets! Anise-y crunch with earthy sweetness. Perfect. I wrote my friend an email, containing a sort of recipe that came out as a stream of consciousness, as I pictured what I might reach for were I making it right then. Roasted beets. Raw fennel, small dice. Toasted fennel seeds. Shallot. Lemon. Garlic. Olive oil. And loads of herbs. I was confident. Of course, I had to try it out for myself. (Can’t let everyone else have all the fun, right?) A couple of filets of sockeye later, cooked according to my latest go-to, foolproof, perfect-every-time method, which you should absolutely try as soon as possible, my confidence turned into unabashed pride. It’s crunchy, it’s sweet, it’s raw, it’s roasted, it’s bright, and it’s just killer with a fine piece of salmon. It’s exactly what I was going for. Here’s hoping it can liven more than one holiday table this year. Bon appétit! This relish is stunning served with a simple roast salmon, though I suspect darn near any fish would work quite well too. I can also see this as an hors d'oeuvre, with crostini and a tangy goat cheese, or even as a topping on those dreadful endive boats (if you insist on using them). You may notice that the recipe calls for golden beets, while I clearly used red beets in the photos; if you don't mind a little staining, it doesn't matter which you use. Use both, if you like. If you can, make this several hours or even a day in advance. It's one of those recipes that drastically improves with a little rest. 1. Preheat the oven to 400º F. Scrub the beets well, and trim the leafy tops which are hopefully still attached (save those for eating another time). 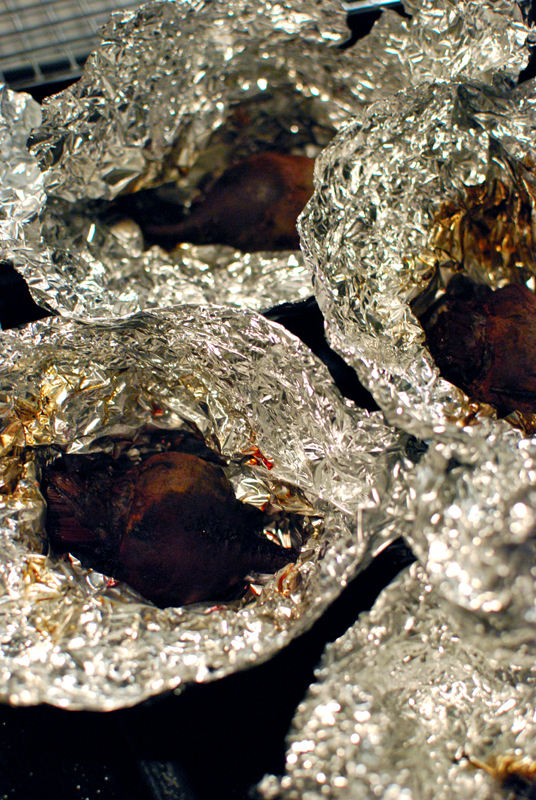 Wrap each of the beets tightly in aluminum foil, and pop in the hot oven for 45 minutes to 1 hour, depending on how big they are. Small ones will, of course, cook faster. 2. Meanwhile, mince the shallot finely and put into a large bowl that won't stain (you know, glass or metal). Zest the lemon into the bowl, and squeeze in all the juice. 3. 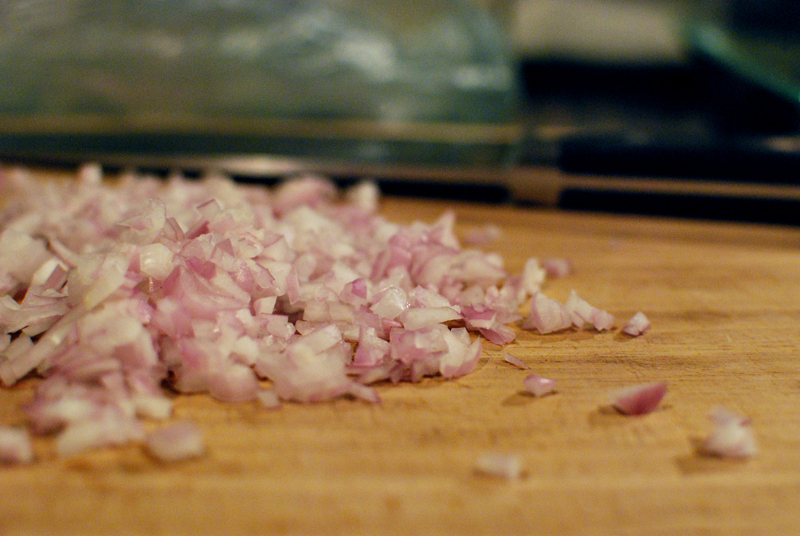 Smash and peel the garlic clove, chop into very small bits, and sprinkle with a generous pinch of salt. 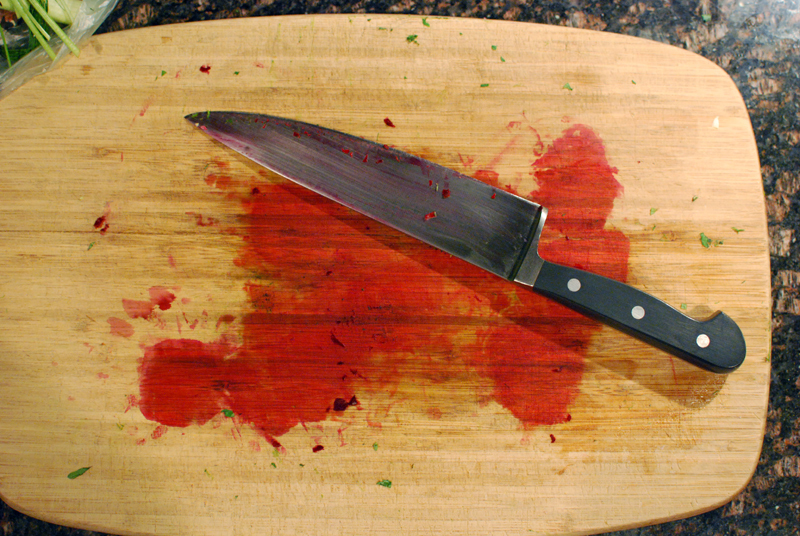 Using the side of your knife, smash and scrape the salted garlic into a paste. Add this paste to the bowl, along with the Dijon mustard. 4. Whisking constantly, drizzle in the olive oil. 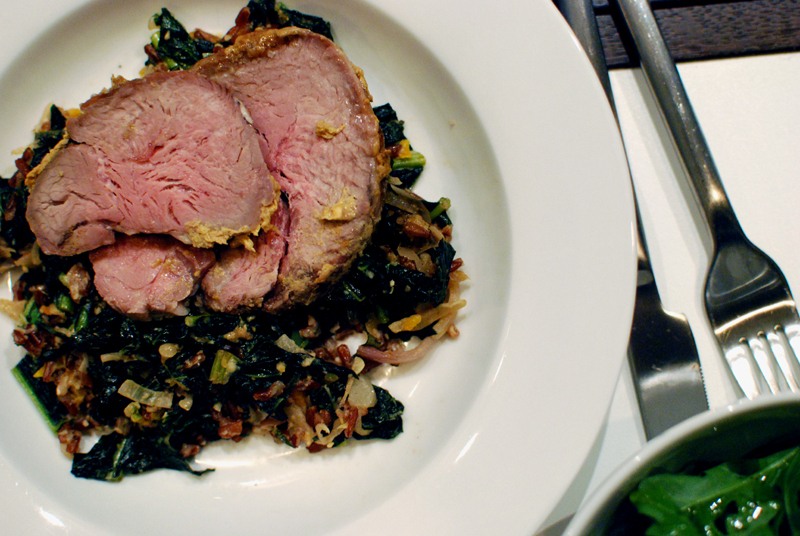 Use only enough to take the harsh edge off the dressing, while still letting the lemon flavor shine. This doesn't need to be perfectly emulsified, so don't worry about whisking it to perfect smoothness. 5. Toast the fennel seeds in a small pan over medium heat for a minute or so, just until fragrant. Either throw them in whole, or crush them up in a mortar and pestle, depending on preference. 6. 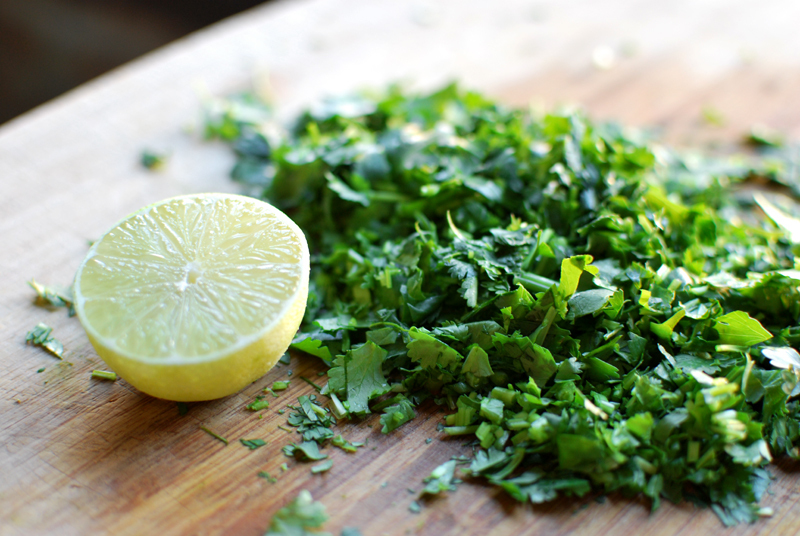 Chop the thyme, mint, parsley, and a handful of fronds from the fennel; add to the bowl. 7. 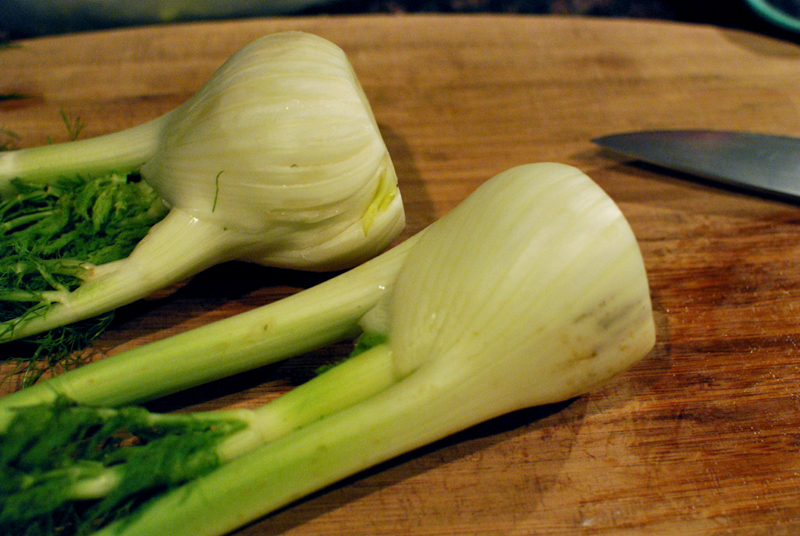 Remove the tops from the fennel, and any brown spots on the outside. 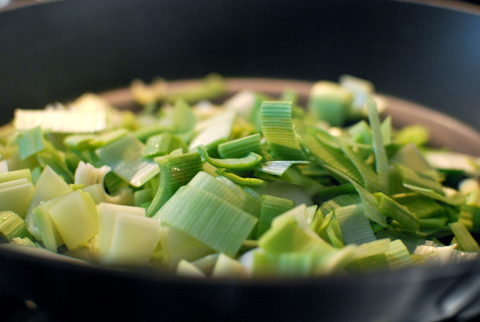 Cut the fennel into a small dice, and add to the bowl with a few grinds of black pepper. Toss well, and let stand until the beets have finished roasting. 8. When the beets are done (they will feel slightly soft when squeezed through the foil), let cool until they can be handled. Peel the beets, chop into a small dice, and add to the other ingredients. Toss together, and taste to check the seasoning. Correct as needed with additional salt, pepper, olive oil, and/or lemon juice. Dinner, from the book I cannot stop using: Plenty, by Yotam Ottolenghi. I must be sounding like a broken record, but that cookbook has majorly influenced the way I cook, both at home and for clients. 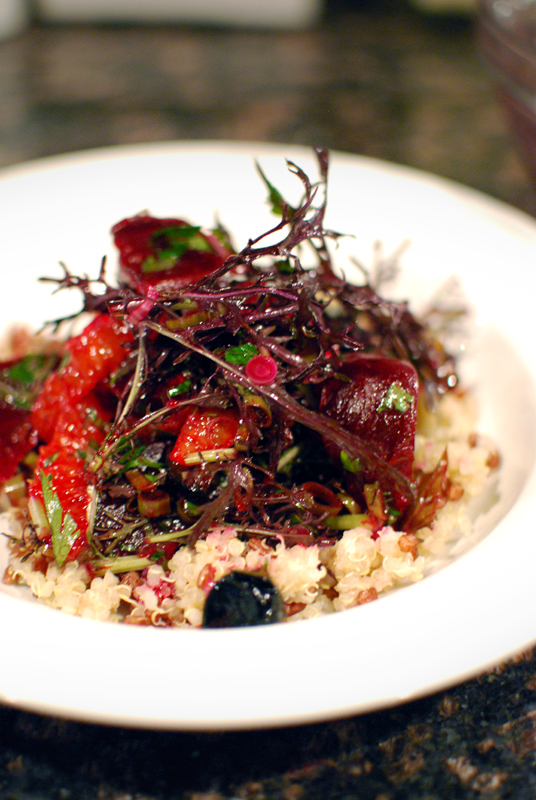 This is his Beet, Orange, and Black Olive Salad (and I didn’t send you, but you can find the recipe here). The flavors in this one are not shy, but much more toned-down than you’d think by looking at the ingredient list. Overall, it’s extremely well balanced, a little unusual, and absolutely fabulous. I modified the recipe by roasting (not boiling) the 4 smallish beets for 45 minutes at 425° F, and serving it over a mixture of quinoa and red rice (1/2 cup and 1/3 cup respectively, by dry measure, cooked separately but concurrently). The (ahem) red salad green was something I picked up at the farmers’ market, and which nomenclature I promptly forgot. It looked like a cross between frisée and some spindly arugula, and had a lovely bitterness. For the olives, I used the wrinkly oil-cured type because that’s what I had. Those are super-pungent and normally bully past every other flavor, but here, they were actually subdued. I might chop them a little smaller next time (I basically just halved them here), but not by much. The saltiness jumping out every so often, not in every bite, was excellent. 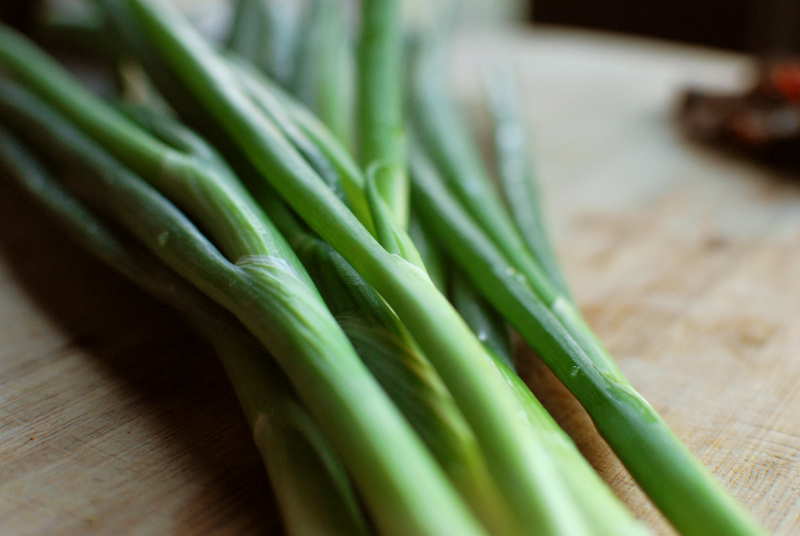 Oh yes, and it’s scallions instead of red onion. I forgot the red onion at the store. Did everyone get their fill of Halloween candy? And now for something a little virtuous on All Saints’ Day, to help bring you down from the sugar high: radishes sautéed with brown butter and a spot of anchovy, tossed with kimchi, radish tops, and brown rice. Top it all off with a luscious fried egg, because hey hey, even saints need a little luxury. Chopping the radishes into irregular chunks makes for a more visually interesting dish, gives variance in texture, and makes the work go faster. Feel free to be more precise if you're having the Queen over for dinner. 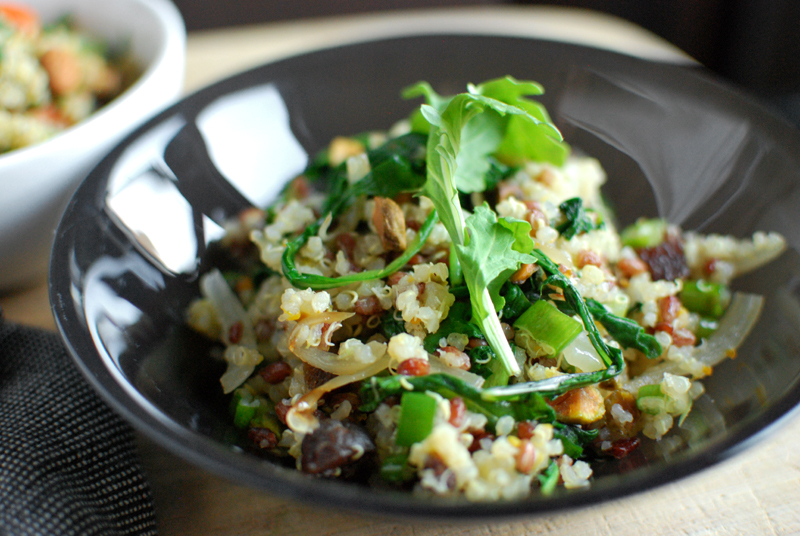 This recipe calls for cooked brown rice, something I usually have in the fridge. 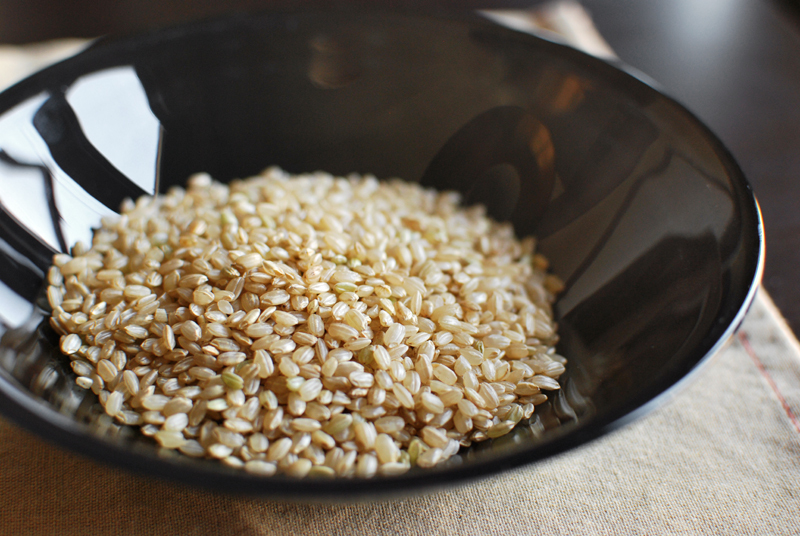 My favorite method for cooking brown rice is from Alton Brown, and results in perfect brown rice. Every. Single. Time. You're welcome. 1. 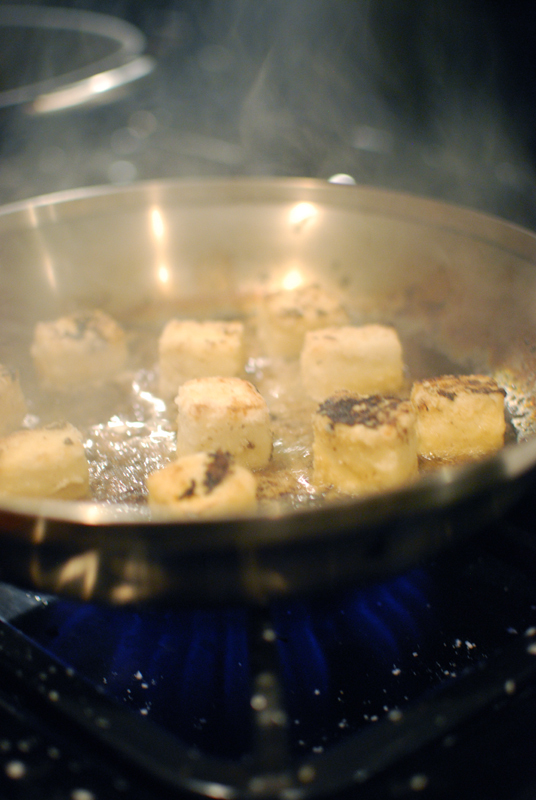 In a large sauté pan, heat the butter over medium-low heat until it browns and smells nutty. Meanwhile, trim the greens from the radishes and set aside. Roughly chop the radishes into irregular pieces, removing the root "tails" in the process. 2. When the butter has browned, turn the heat to medium-high and add the anchovy, mashing with a spatula or wooden spoon to break up the fillets. Throw in the radishes. Toss to coat with the butter, and season with a pinch of salt. 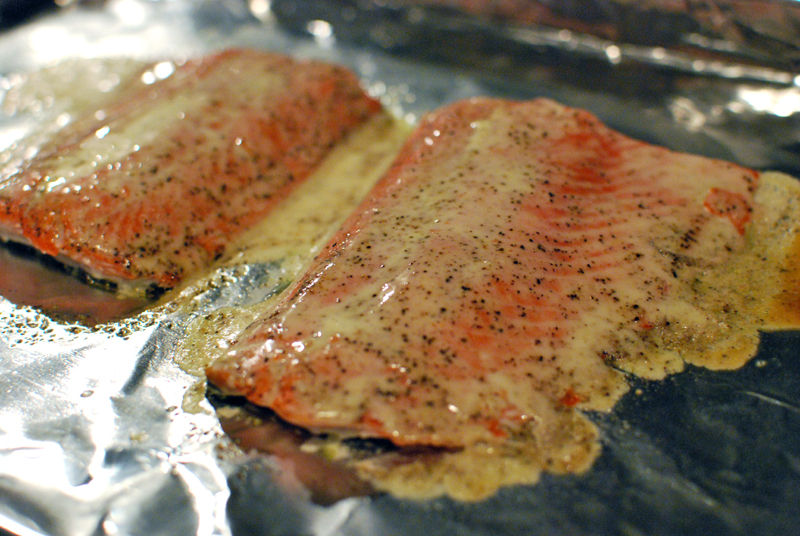 Let cook until softened and just beginning to brown. 3. Add the kimchi, and let cook briefly, about 1 minute. Toss in the rice, and cook until it's as done as you prefer it (anywhere from just warm to crunchy and brown). Add the radish tops (no need to chop or dry them off), and toss or stir until wilted. Taste, and add lemon juice, a dash of soy sauce, salt, and pepper. Taste again and correct seasoning as you like. Remove to plates or a bowl, and keep warm. 4. Add a bit of butter or oil to the pan, and set over medium-high heat. Crack eggs into the pan and fry to desired doneness (runny yolks are highly recommended). 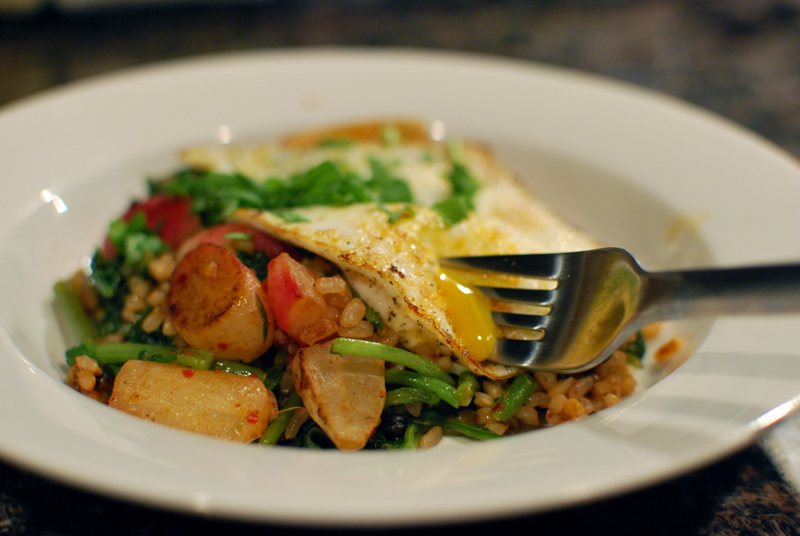 Top the radishes and rice with the eggs, and serve at once. Beer, though not required, is really, really nice with this one. 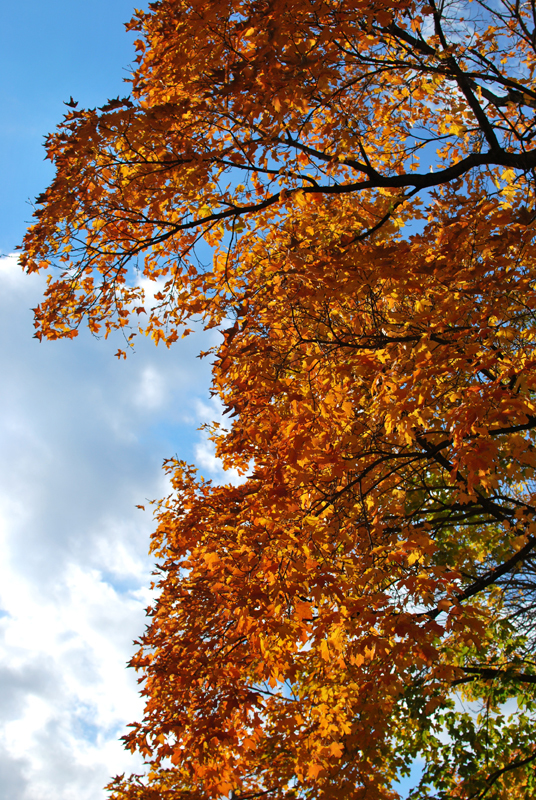 The days are still sunny and edging on warm, but the nights are quickly cooling and coming on sooner. 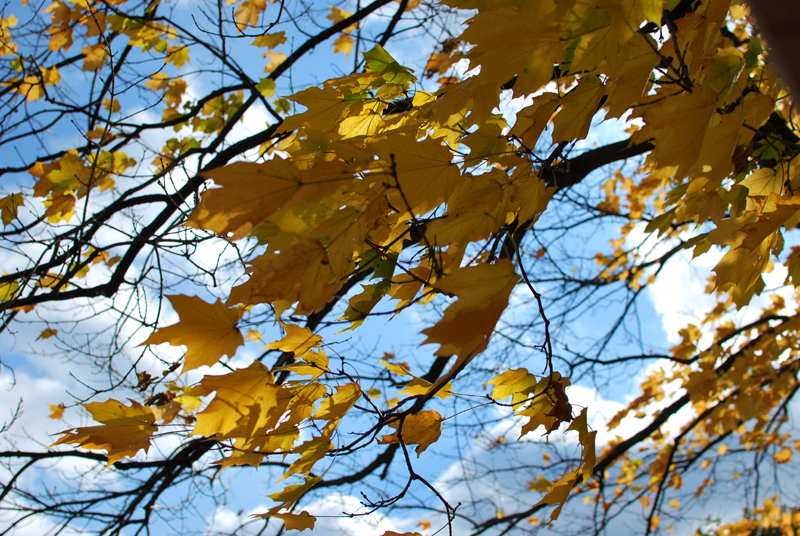 Leaves are just starting to make brilliant yellow carpets to crunch under feet not yet in Winter boots. Loose buttons on coats begin eyeballing me ruefully, threatening to finally jump ship this season if I don’t take action. And everywhere I look, it’s pumpkin spice this, maple that. It’s apple spice crumbles (apple everything, really), brown butter, and, of course, a rogue peanut butter cookie. Yes, some soups are appearing one by one, and the braises thus far are mostly in reference to Oktoberfest (which Americans should really be celebrating in a different way than with German beer), but everything is sugar and spice and everything nice. And I’m not on board with that. Typically, it’s Spring Cleaning. Clean out the cobwebs of Winter, let the warm air in! But me, I prefer Autumn for my Massive House-Cleaning. I’d much rather cuddle into clean blankets when it’s cold. I want to sweep away the dust that blew in through open Summer windows before closing them for six long months. Like trees shedding leaves indiscriminately, I ruthlessly cull unused things from my home: clothes, makeup, cooking utensils, books, shoes, dying plants. Fall seems to me a time of nesting, of preparing for the season of hibernation. And people, I want my nest to be spotless. Getting rid of stuff is one of my favorite things. The feeling of donating boxes (boxes!) of items that took up precious space in my 500 square feet of home… there’s nothing like it. Where did all that junk live? What was I doing with it? Where did it even come from? Who cares! It’s gone!, glorious empty space left in its wake. The fewer items I have, the more valuable and important the remaining ones are, pared down to the most useful and most loved. 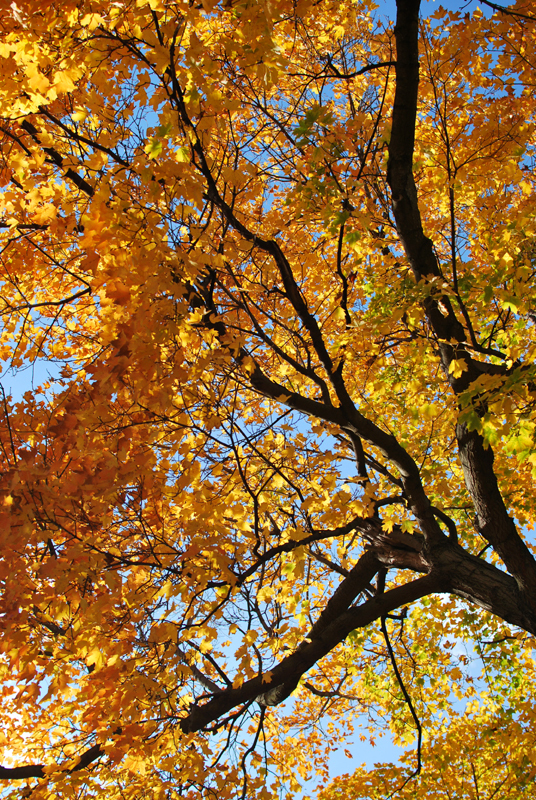 In the Fall, I want what I cook and eat to feel as uncluttered as the rest of my home. Simple. Easy. Minimal. Less stuff, more joy. So the idea of feasting on heavy and rich braises, or of baking endless trays of cookies, pies, tarts, and cakes just seems wrong after I’ve spent hours or days scrubbing and polishing and vacuuming and eliminating junk. It’s unbalanced. 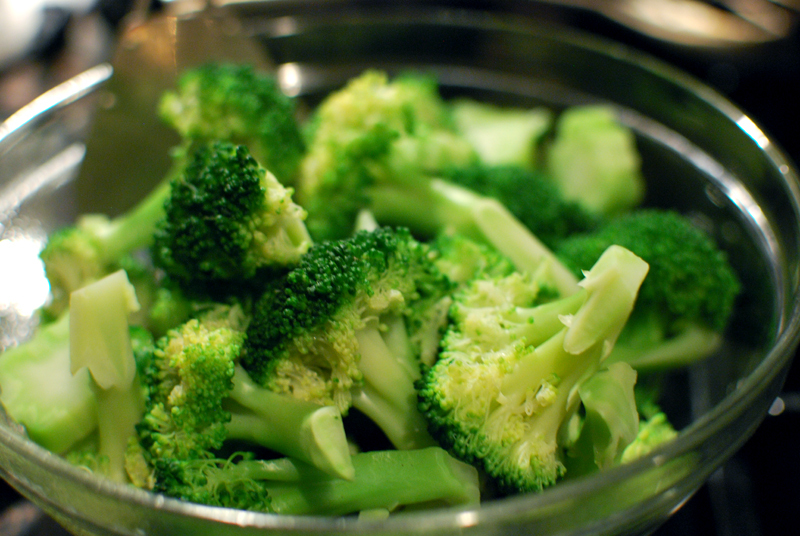 My favorite food for such times (can we please not call it a detox? I prefer “hitting the reset button”.) 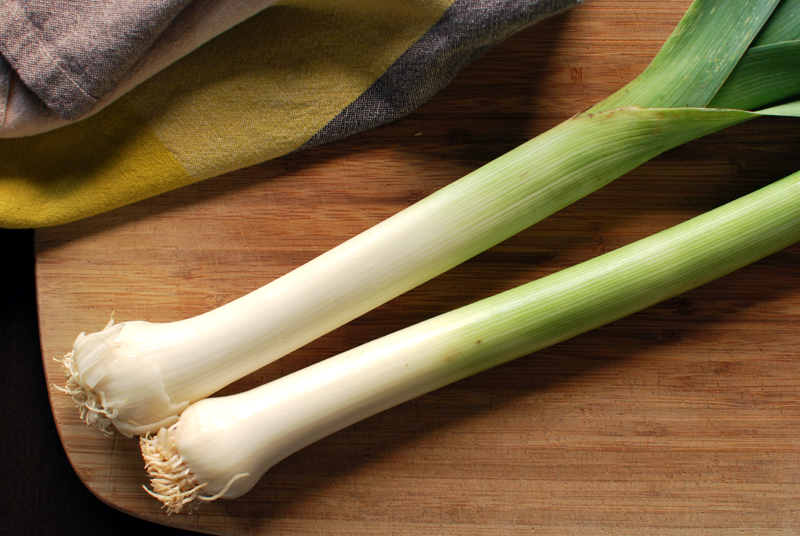 is the leek. 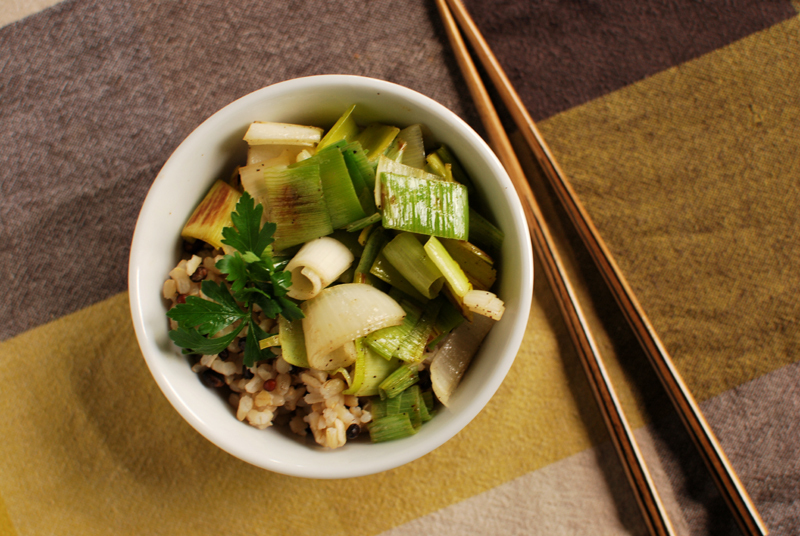 For sheer simplicity, it doesn’t get any better than a dish of brown rice and leeks sautéed in a little olive oil. Small portions, and let’s sit at the proper dinner table instead of hunching over the coffee table. Eat slowly. I like to eat this for as many meals as I can stand (yes, even breakfast), for as many days as I can stand, or until I feel like it’s done its job. Usually, just a couple of days does the trick. I feel calmer, food tastes better, it’s easier to listen to my body. Everything feels lighter. The reset button has been pushed, and I feel great. This dish is surprisingly filling and satisfying, though it's hardly a recipe. 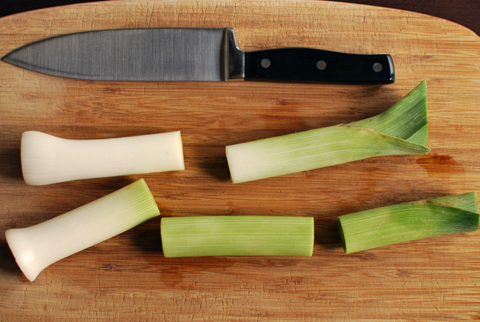 These instructions are more about how to prepare a leek, which might seem intimidating if you've never used one. They grow in very sandy dirt, which tends to get trapped between the layers of leaves, and can be gritty if you don't rinse it all away. But do not let yourself be intimidated by a vegetable. It's easy, watch. 1. 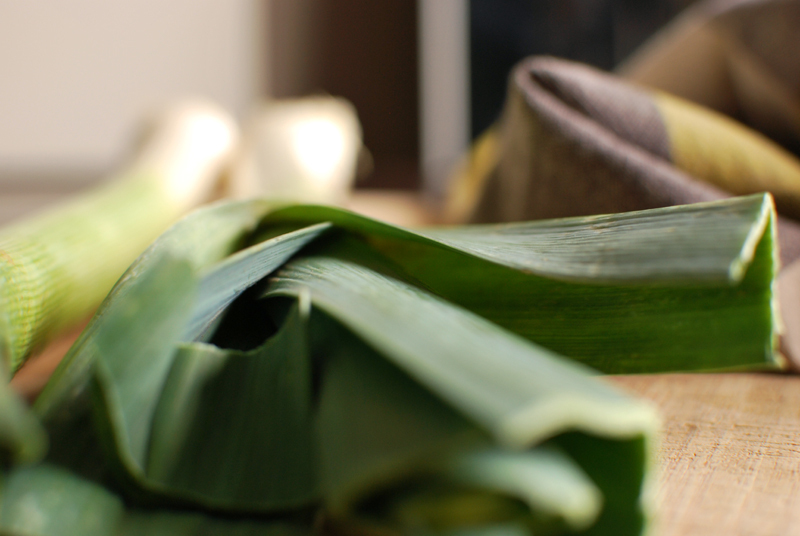 Rinse the leeks of any major dirt. 2. Cut off the tough dark green tops. Wash them well, and save in your stock bag in the freezer, if you're into that. Cut off the root ends and discard. 3. 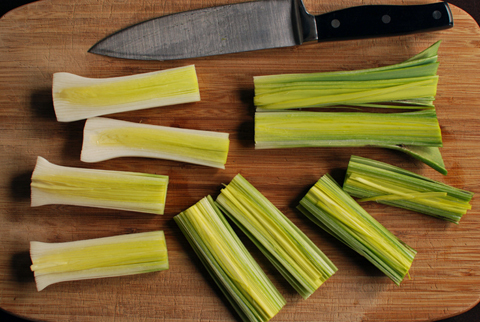 Cut the leeks crossways into two or three big chunks. 4. Cut each piece in half lengthwise. 5. 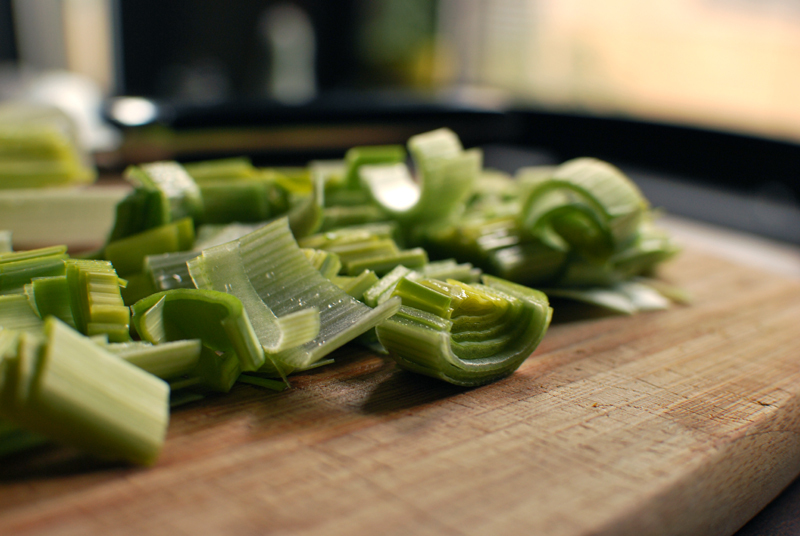 Rinse the leeks under cold running water. The pale white parts may not have any dirt to wash away, but the greener bits will certainly have dirt that might need to be rubbed away with your fingers. 6. 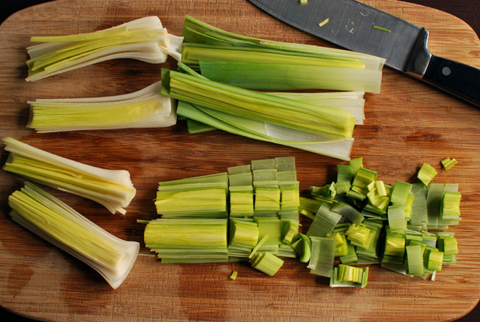 Roughly chop the leeks crossways into 1/2 inch pieces. 7. Heat a splash of olive oil in a large sauté pan over medium-high heat. 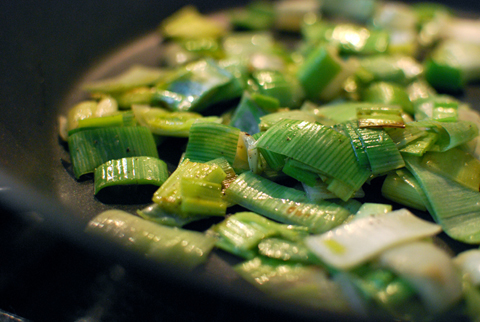 Add the leeks, and toss to coat with the oil. Sprinkle with a pinch or two of salt and black pepper. Cook for a minute or two, or until they soften and begin to brown in spots. 8. Reduce the heat to medium-low, and cook until they have softened to taste. I prefer mine slightly al dente, and so only cook them for another minute or so. 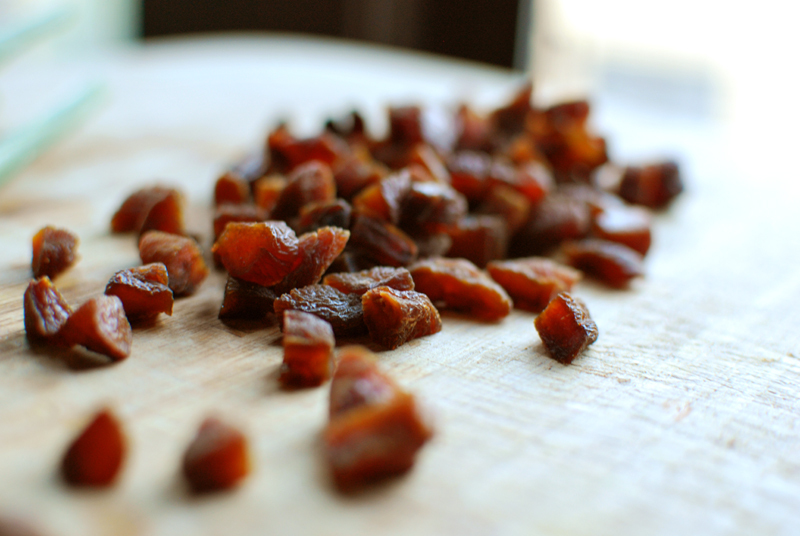 You can take them all the way to caramelized, if you like, but you'll end up with not very many to eat in that case. 9. 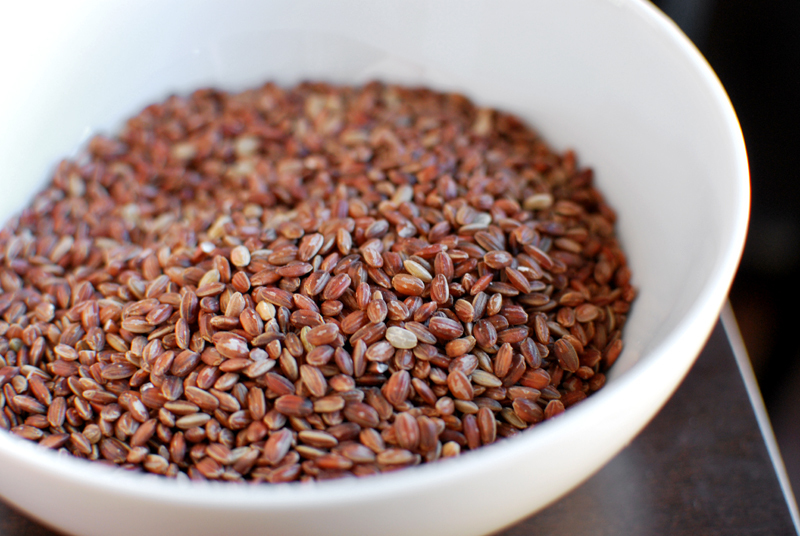 Correct the seasoning if necessary, and serve over warm whole grains. A squeeze of lemon and a little parsley would not be out of place, though certainly not needed. I have a problem when it comes to following recipes. Unless it’s a baked good, I appear to be almost entirely incapable of following those carefully-written instructions. Sometimes, it works quite well. I tweak an ingredient (or four), and all is well in the end. 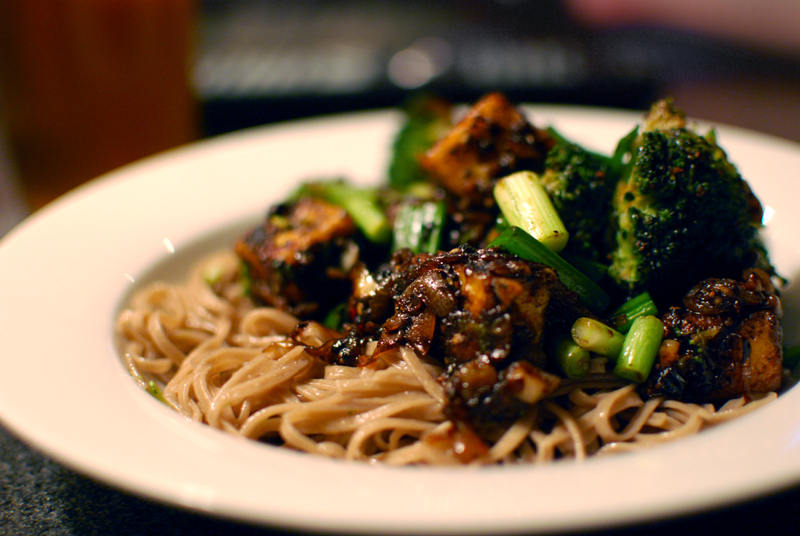 And then, I end up with a huge pan full of gorgeous tofu and broccoli and soba that is smothered with a sauce that has the consistency of gritty, sandy dirt. Actually, I think the dirt might’ve had a better texture. Oh, and the house filled up with smoke, let’s not forget the house full of smoke. So much smoke. It took me all flippin’ night to cook it, too. That’s the worst part, so much work for next to no payoff. The intention was, of course, to post a recipe, but I don’t recommend anyone actually follow the recipe I ended up with. I’m saving you much heartache. It was not spicy enough, far too laborious, and lacked some sort of oomph. Not to mention the rather, um, abrasive texture. 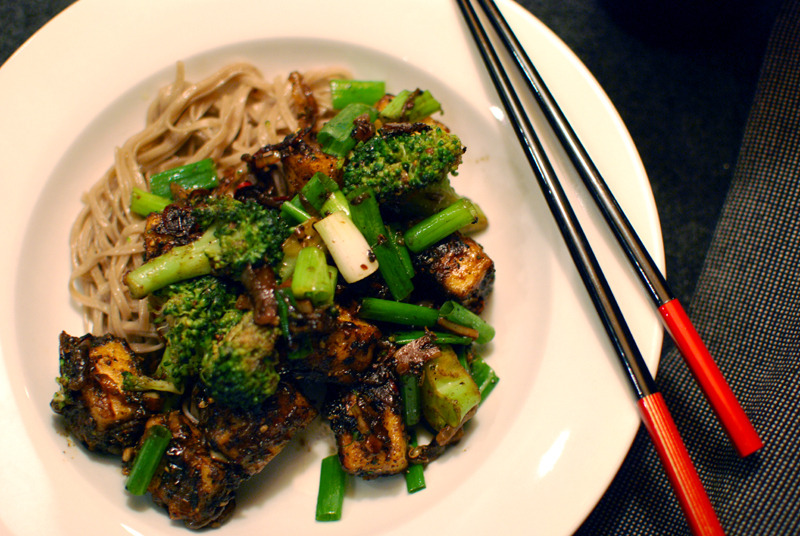 One major adjustment was made to mimic a dish I devoured recently, one that was redolent with the brilliant numbing tingle of Sichuan pepper. 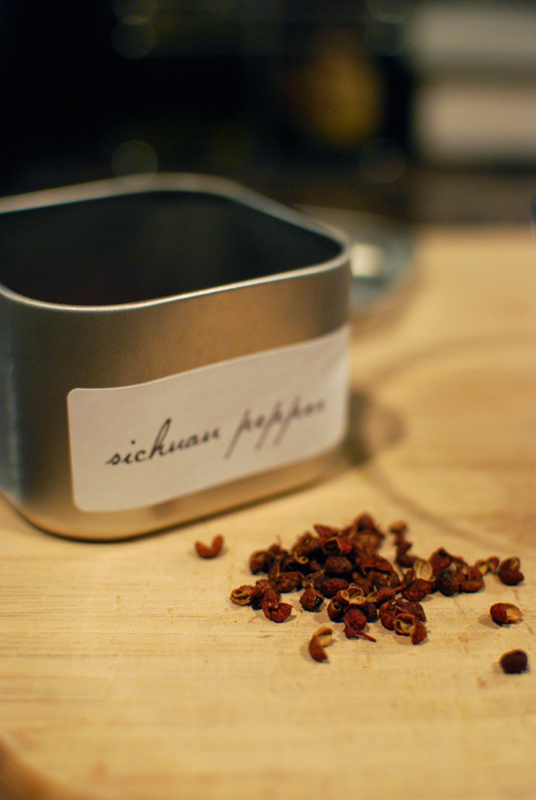 I wanted to showcase the Sichuan peppercorns I ecstatically bought in response, and have been unsure of how to use ever since. But apparently, the seeds must be painstakingly culled from the husks, as they have a (drum roll please) very gritty texture. If anyone has helpful tips on how to use the things, I’m all ears. Please. Yes, I ate it, mostly out of spite. No one else really did. 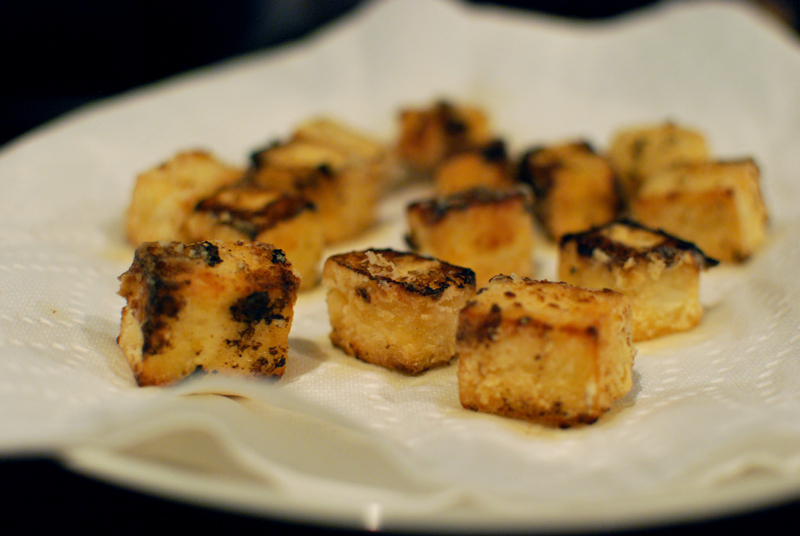 So, lessons learned: Do not fry loads of tofu in a small apartment. If you think it’ll be too much food, you’re probably right. Research unfamiliar ingredients. Trust the author. If you have to utter the phrase, “Guys, this might actually be inedible,” just give up and order takeout. I don’t typically travel a heck of a lot. Most of the time, you’ll find me within a five-mile radius of my kitchen. But tomorrow (Thursday), I’m jetting off to my hometown, New Orleans. First I’ll be attending the International Food Blogger Conference (and if you’re going too, I’d love to meet up with you!). After that, I’ll be helping my family through one surgery (which I’m trying to not worry about obsessively). I’m going away for eleven days, which isn’t very long, but it’s long enough that I couldn’t leave my sweetheart behind without some home-cooked food. I have dug my own grave on this one, and absolutely crippled my boyfriend in the kitchen. Not that he can’t or won’t cook, it’s just that… well, we have an unspoken understanding that dinner is probably going to be better if, you know, the professional chef cooks it. He does help. Also, I was only slightly afraid that he might subsist purely on cereal and take-out for eleven days if I hadn’t made a little something nutritious to tuck in the fridge. Okay, fine. If I’m honest, this was all a fine excuse for a blog post. 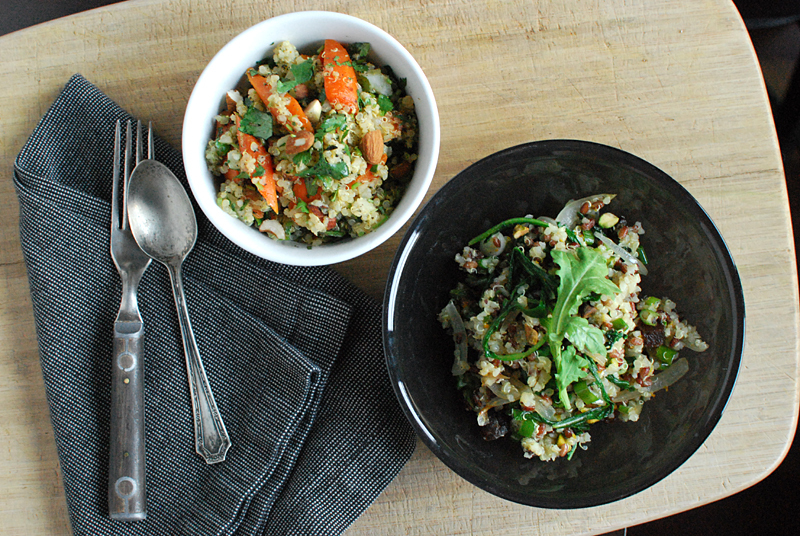 Drawing inspiration from my latest favorite cookbook and chef, Plenty, by Yotam Ottolenghi, I made for him two grain-based and vegetable-heavy salads, one with carrots, quinoa, lime, and cilantro, the other with quinoa, red rice, pistachios, and dried apricots. 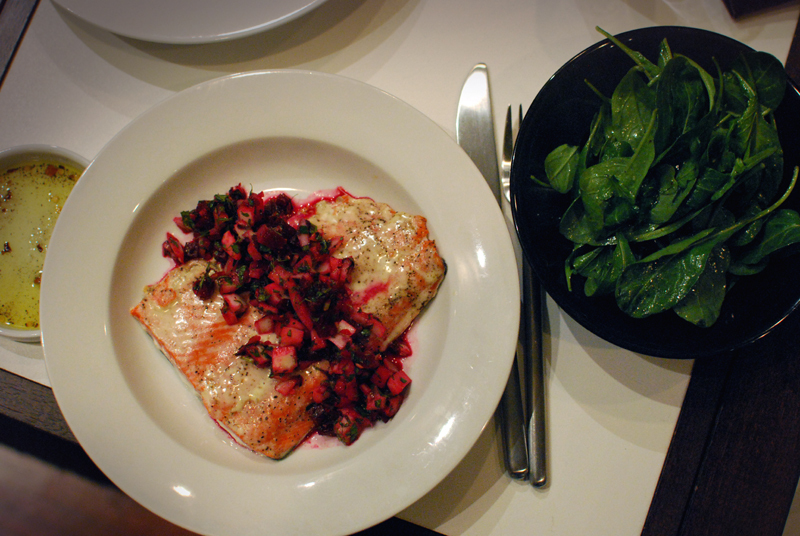 These two dishes are exactly the kind of thing I could eat quite happily for the rest of my life, day in, day out. 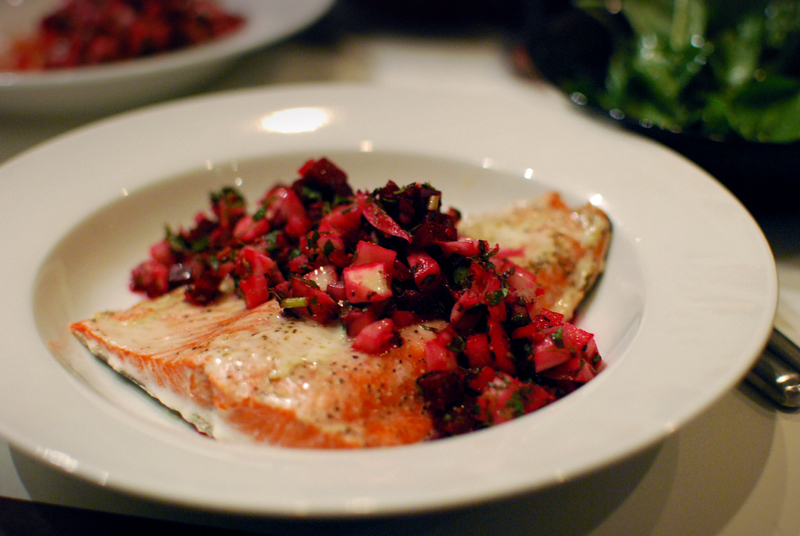 The one word that comes to mind when I think about Chef Ottolenghi’s food is “generosity”. 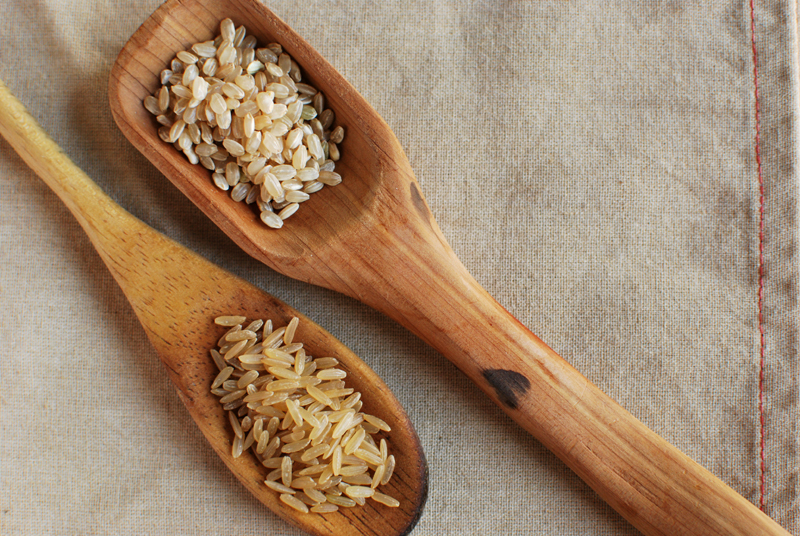 Often, there isn’t just one type of grain, but two. Or, occasionally, more. (Shock! Eyes widen!) Flavors aren’t delicate or precious, but bold and effluent. Herbs, in particular, are used with a hand so heavy it borders on leaden. It just feels downright generous to pile mounds of herbs onto big heaps of vegetables and grains, and mix it all up in your largest bowl, using your entire arm to stir. This is the sort of thing that’s been heavily influencing my cooking of late. 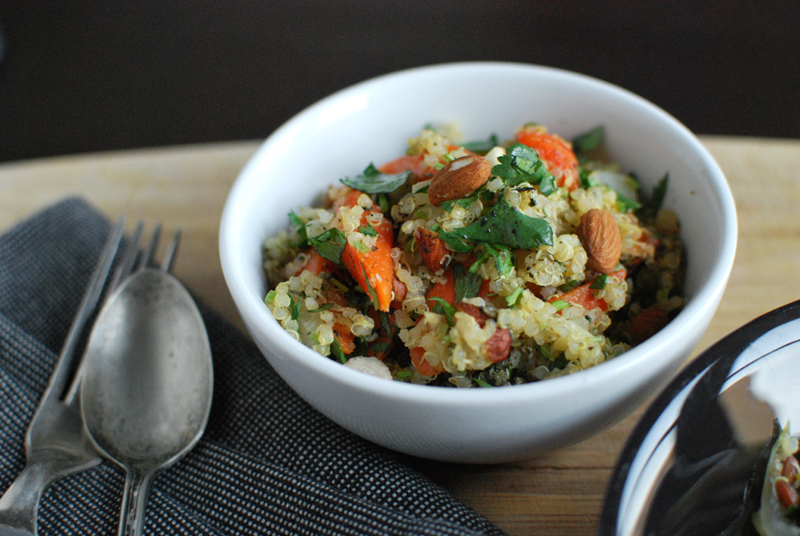 In-season vegetables, fresh herbs, whole grains, unrestrained flavors, always a hit of citrus. This is also the sort of thing that is ridiculously good for you, which is great, because I could eat buckets of it. I hope to see you at IFBC, but if I don’t, maybe one of these salads will make your weekend a little more generous. Even if you just make it for your blog. I neglected to note how many pounds of carrots I used, but I know there were 10 of them, and they were on the smaller side. 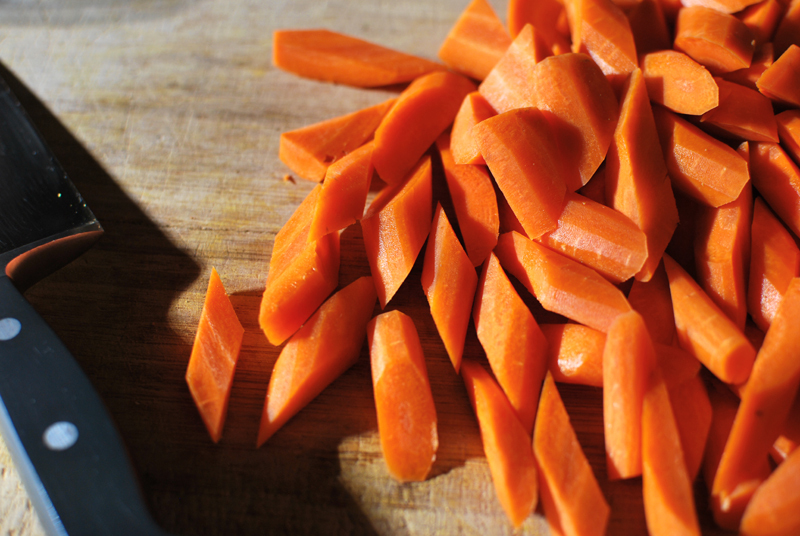 If you love carrots, use more. If you don’t, use less. Either way, use your judgement. 1. 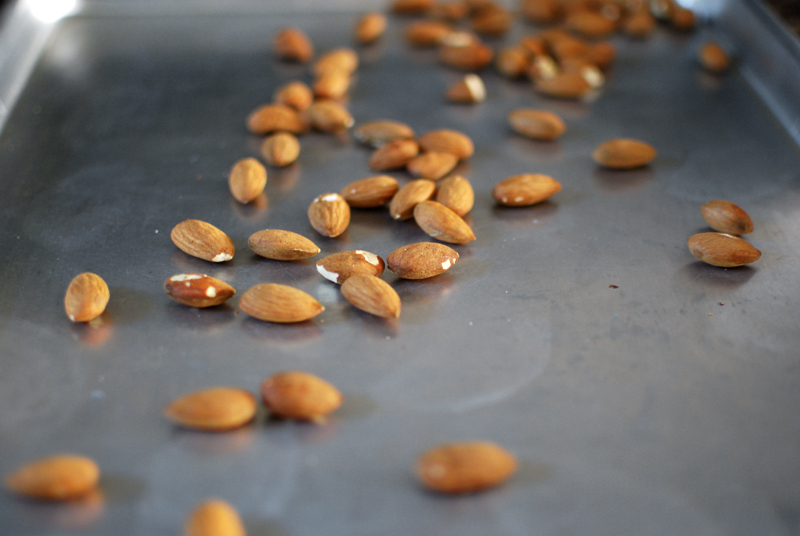 To toast almonds, heat oven to 350º F. Spread in an even layer on a sheet pan, and bake for 7 to 10 minutes, or until fragrant. Chop roughly while still warm, and set aside. 2. 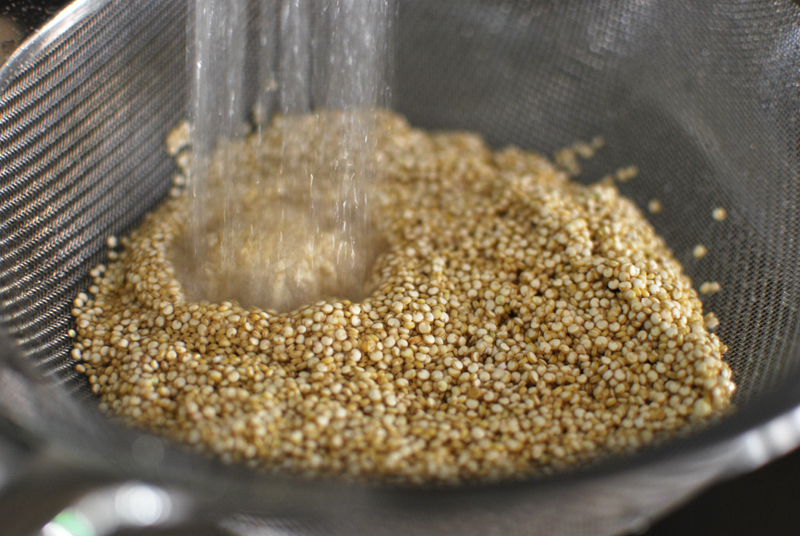 Meanwhile, rinse the quinoa in a fine mesh sieve until the water runs clear, swirling with fingers to help agitate the grains. (This rinses off a natural coating that, when cooked, tastes bitter.) Let drain a bit. 3. 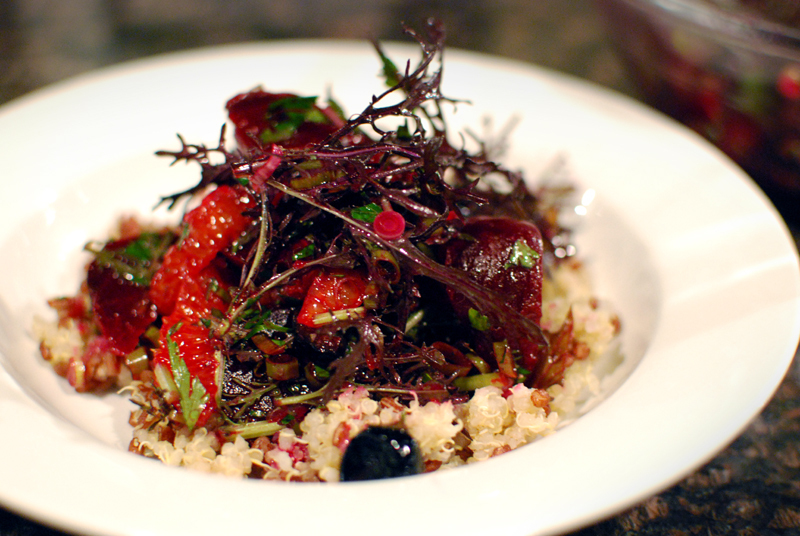 Place the quinoa in a medium saucepan, over medium-high heat. 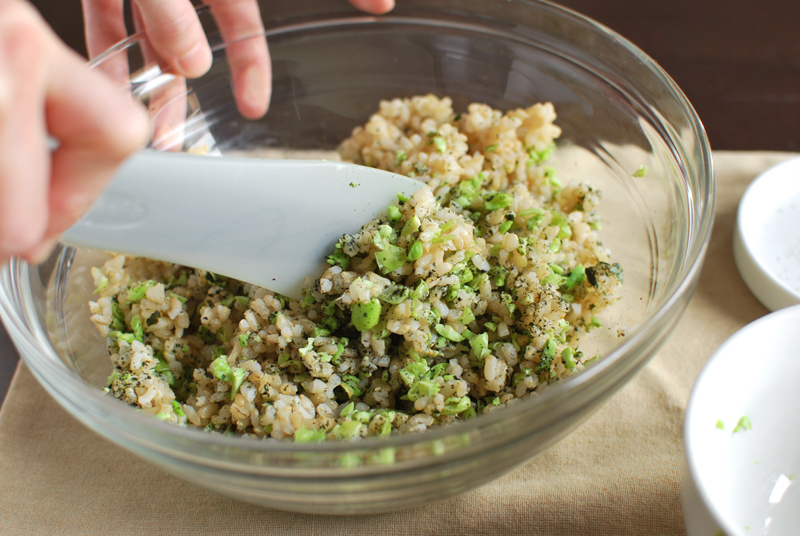 Stirring constantly to prevent burning, toast the quinoa until fragrant, and grains dry and separate, about 3 minutes. You should not hear any sizzling when the water has fully evaporated. Add the water and salt, and bring to a boil. Cover, reduce heat to low, and simmer for 12 minutes. Remove from heat. 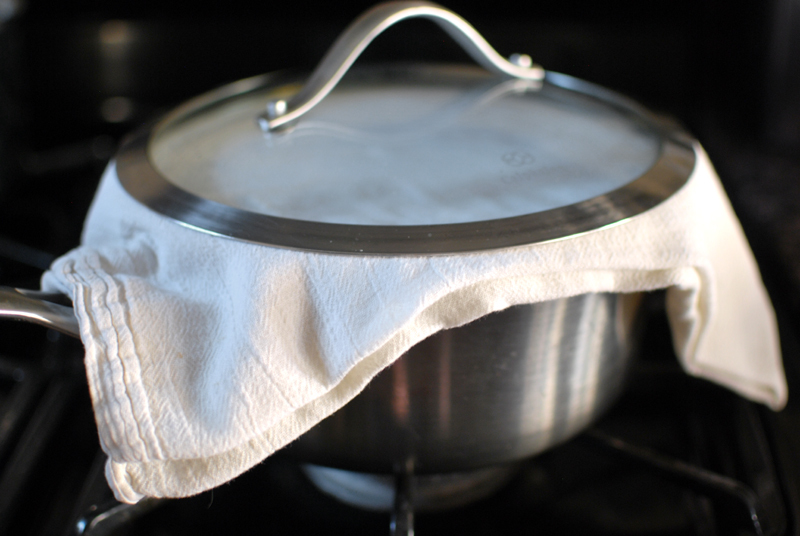 Place a clean towel between pan and lid (to help absorb excess moisture), and let stand 5 to 10 minutes before fluffing with a fork. 3. 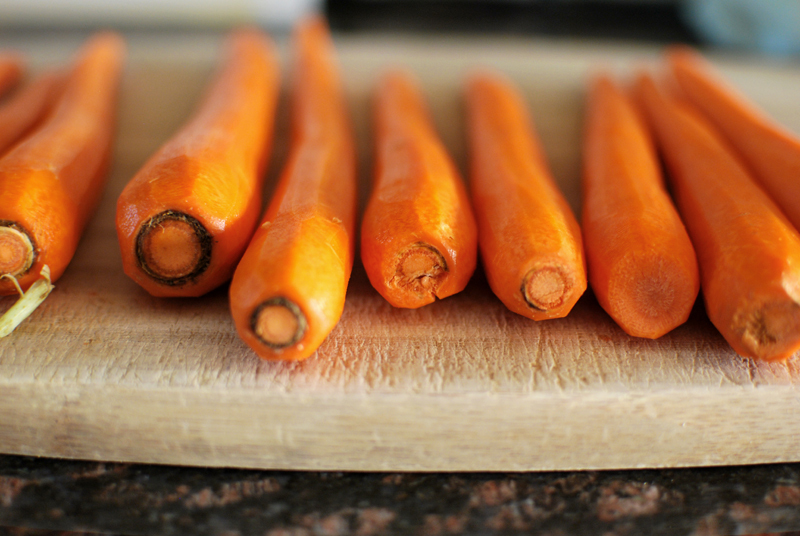 While quinoa cooks, prepare the carrots. 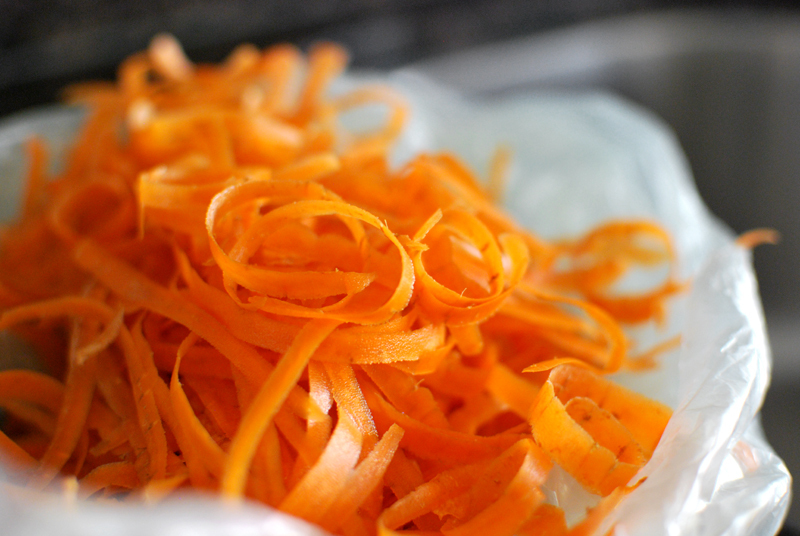 Peel, halve lengthwise, and chop into roughly 1 inch lengths (on a bias if you want to be fancy). 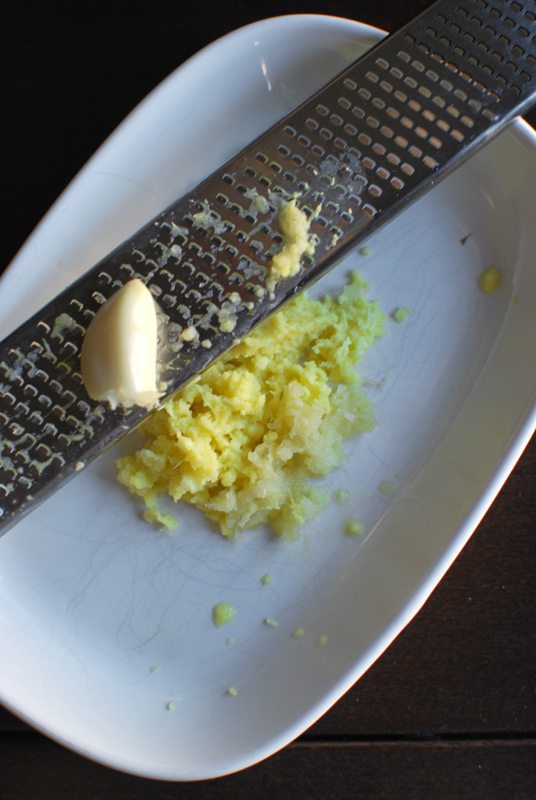 Mince or grate the ginger and garlic. 4. In a large skillet with a lid, heat the olive oil over medium heat. Add the carrots, ginger, garlic, cinnamon, and a pinch of salt. Toss to combine, and cook until fragrant, about 3 minutes. Do not brown. Add the chicken stock, and cover the pan. Cook until the carrots are just tender, 3 to 5 more minutes. Remove the lid, and let any remaining liquid reduce until thick. Remove from the heat. Stir in the butter and Sriracha. Let cool briefly. 5. Zest and juice the lime into a large bowl. Add the carrots, and toss. 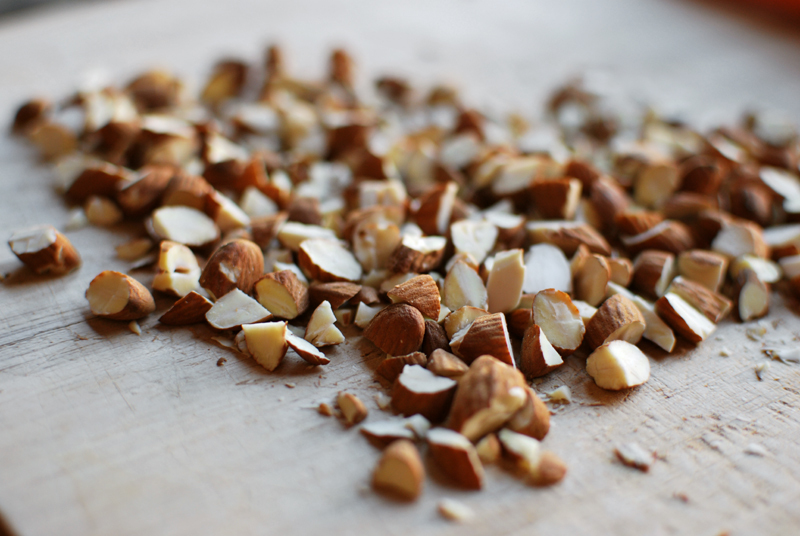 Mix in the cooked quinoa, toasted almonds, cilantro, water chestnuts, and furikake (if using). 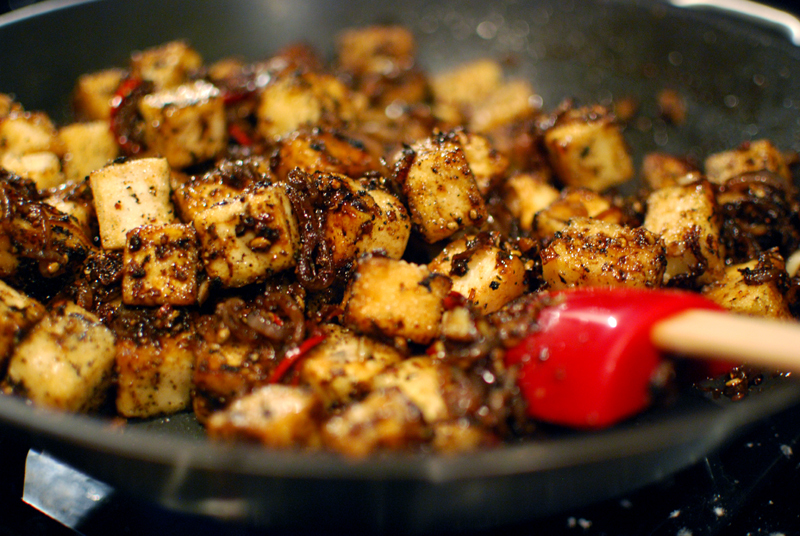 Taste, and adjust seasoning as needed with salt, black pepper, and olive oil. Serve warm, at room temperature, or cold. Recipe can be found here. I changed (practically) nothing, aside from wilting the arugula slightly so it would keep longer, and mixing it in. Don’t be hesitant to use two grains in one salad; the variance in texture is delightful, and it’s scarcely any more trouble. 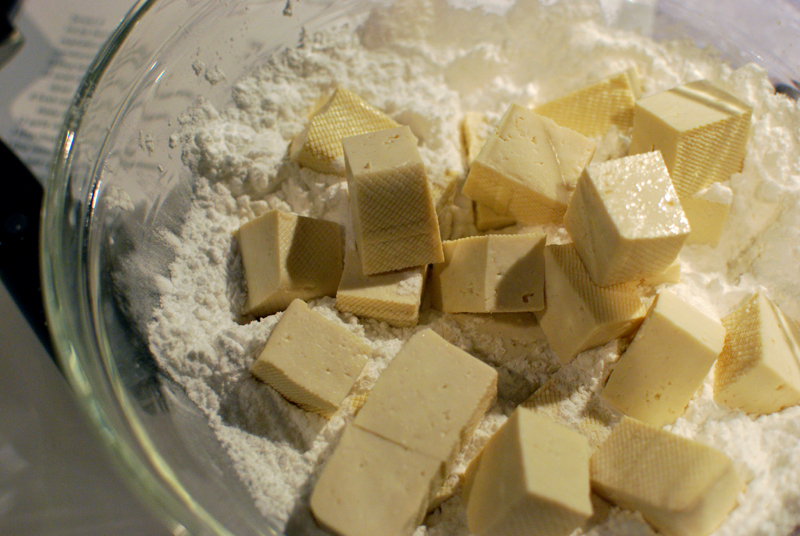 Also, I took some pictures of the ingredients, and I’m darn well going to use them. I love cooking. That’s probably quite apparent, what with the food blog and all; and it’s even more apparent when you consider that I cook for a living, too. So why, then, can I never be bothered to make myself lunch? In the middle of the day, if it takes longer than about two minutes to prepare, it isn’t happening. This from a girl who spends entire days preparing totally-from-scratch meals for others, and loves it dearly. 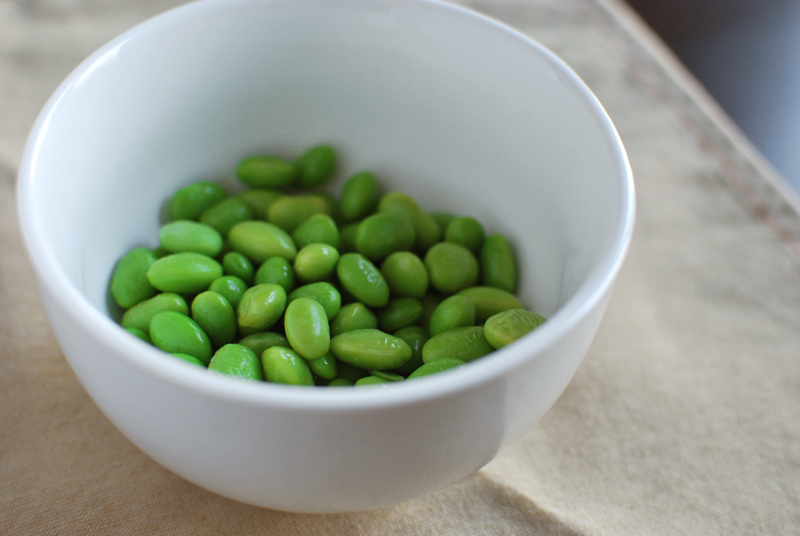 Most often, my lunch ends up being a bowl of brown rice and edamame, two things I make sure to always have on hand. If, by some misfortune, there is no cooked brown rice in the fridge, I consider myself ess-oh-el. Much hand-wringing ensues, followed by apples and cereal, or the rare sighting of a fried egg. I’ve gotten into the bad habit of only bringing basically a Lärabar and an apple to work, which is simple, delicious, and portable, but it’s not really enough to keep my energy up during a day of cooking. This explains why I sometimes feel exhausted at the end of the day, with only enough left in me to haul myself home and onto the couch. Add beer or wine, and internet. Stir. Serve chilled. Trying to come up with a way to reformat my go-to lunch into a work-friendly snack, I had the idea long ago to make onigiri, the famous Japanese comfort food that was designed to be a traveling snack. I knew it was, at its most basic, just a ball of rice, but I had assumed it was made of sushi rice (i.e., seasoned with salt, sugar, and vinegar), so I dismissed the thought. I hadn’t ever had luck with making good brown sushi rice; further, neither I nor my hypoglycemic tendencies wanted to resort to white rice, or any kind of rice with sugar. But in recently looking up recipes for furikake to jazz up my plain rice and edamame, I found I had been wrong. Onigiri is, in fact, never made with sushi rice, but rather with plain rice. The sky opened, and angels sang; my dream of onigiri was reborn. There are ten million different ways to make onigiri, depending on how the rice is seasoned, whether or not it’s filled, what sort of filling, how it’s shaped, and so on. There is but one requirement: short grain rice is mandatory. Long grain rice will never stick together properly, and medium grain is iffy at best. Do not use jasmine, do not use basmati, do not use Uncle Ben’s. Do not use Minute (ever, not just for onigiri). Do not pass GO. Do not collect $200. short grain on top, long grain on bottom. see the difference? use the one on top. 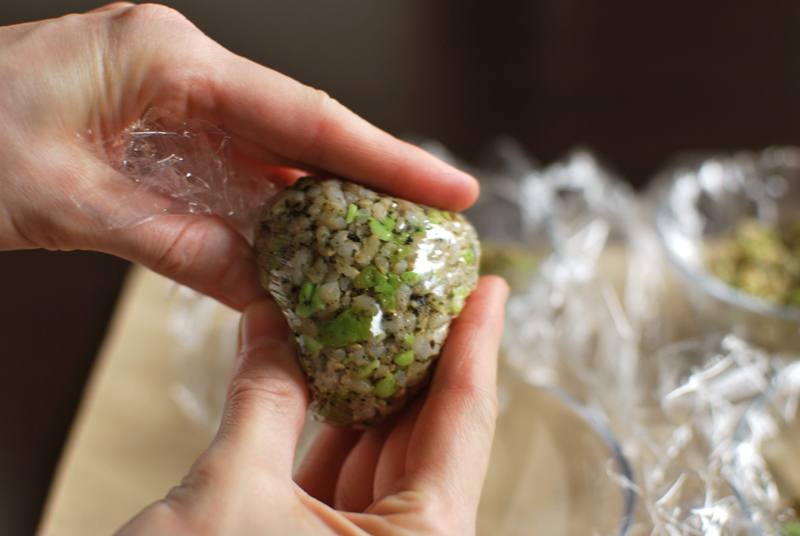 I decided to use the following method to make my onigiri (learned from the delightful Just Hungry) not only because it works particularly well with brown rice, which will always have a harder time sticking together than white rice, but also because it automatically packages the onigiri in the process. It’s ideal for my particular amalgam of laziness and snobbishness. This is about 2 cups of cooked short grain brown rice. It will make four smallish onigiri. I want to keep them small, so I can eat one easily and quickly while sautéing or whisking or what-have-you. There is no sitting down or stopping to eat at work. did i mention this is short grain rice? use short grain rice. 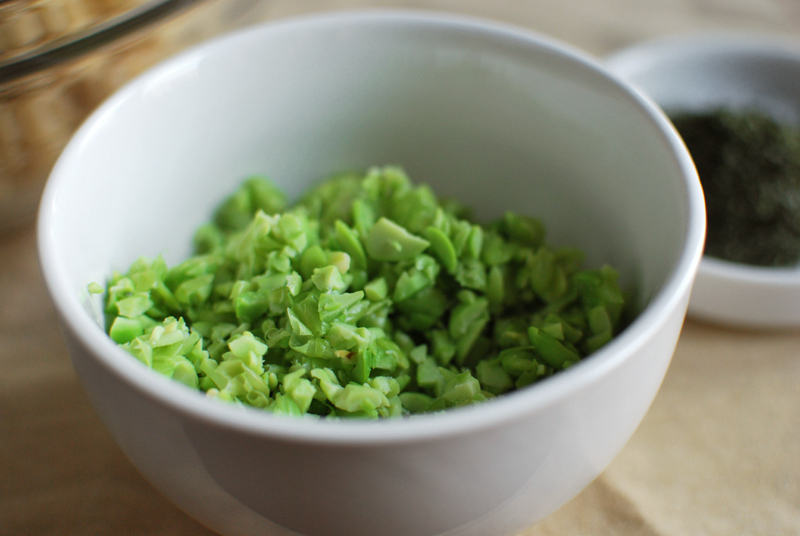 It gets mixed with about 1 cup of frozen shelled edamame, which was thawed in the microwave and pulsed a few times in a food processor. 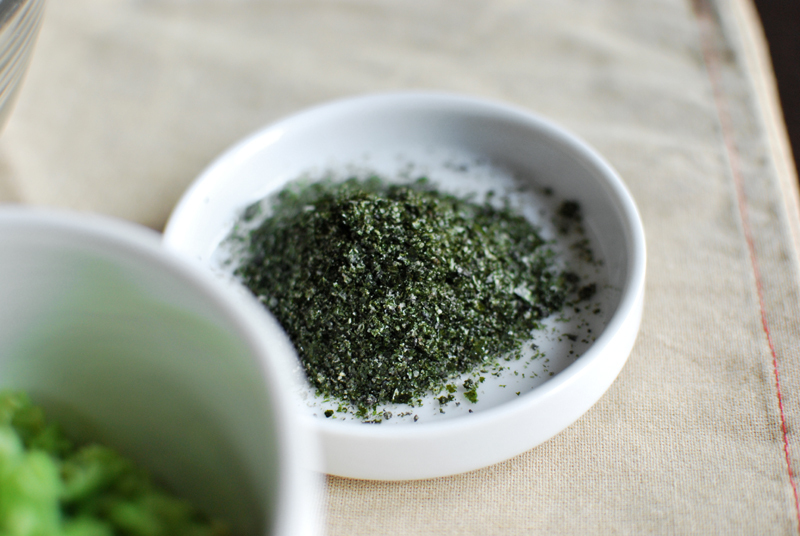 To season, about 2 tablespoons of black sesame and nori furikake, more or less. This mixture has enough salt in it to adequately season the rice, which can taste a little bland if too little is used. 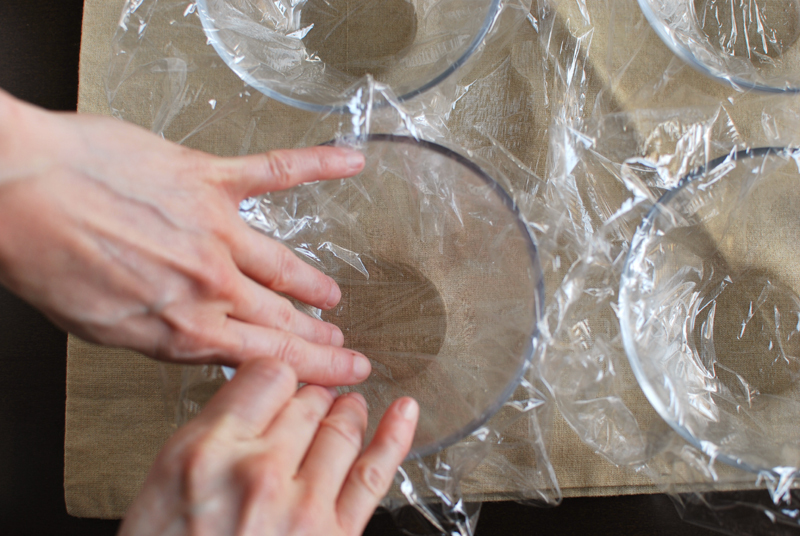 Line four small bowls with plastic wrap, or line one bowl four times. Whatever works. Try to press it in evenly, with no big wrinkles. 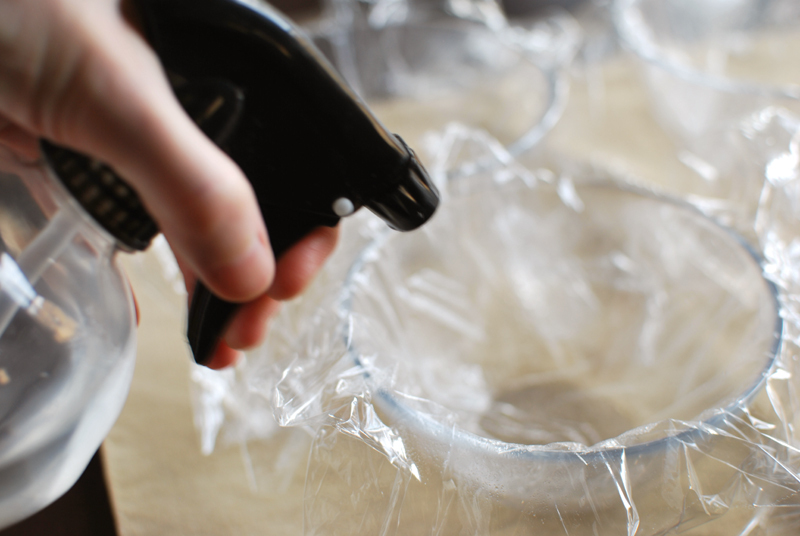 Either spray or drizzle in water, just enough to moisten the plastic without pooling. A spray bottle works wonders here; this is a cheap one I picked up god-knows-where for no more than a couple of dollars. It’s useful to have around, especially when the cats misbehave. A light misting of moisture keeps the rice from sticking to the plastic. I haven’t tried omitting this step; maybe it’s unnecessary, but I don’t mind doing it and my rice hasn’t stuck yet. Divide the rice evenly between the four bowls. 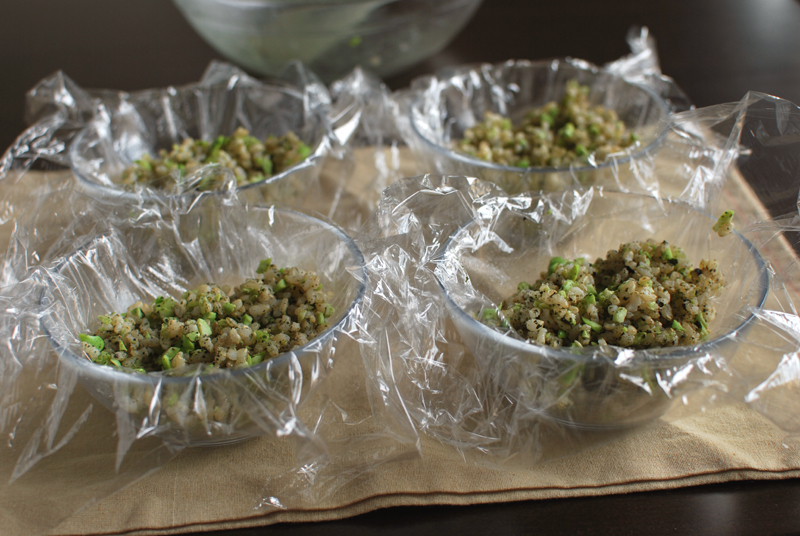 Gather up the plastic wrap around the rice. Press the rice together and squeeze out as much air as possible. Don’t crush it, but compress it well. Twist the plastic to hold it all together. This is basically the end of the process (thanks again to Just Hungry for the technique), but if you want the traditional triangle shape, now’s the time to make it: just squeeze the ball into a triangle shape. 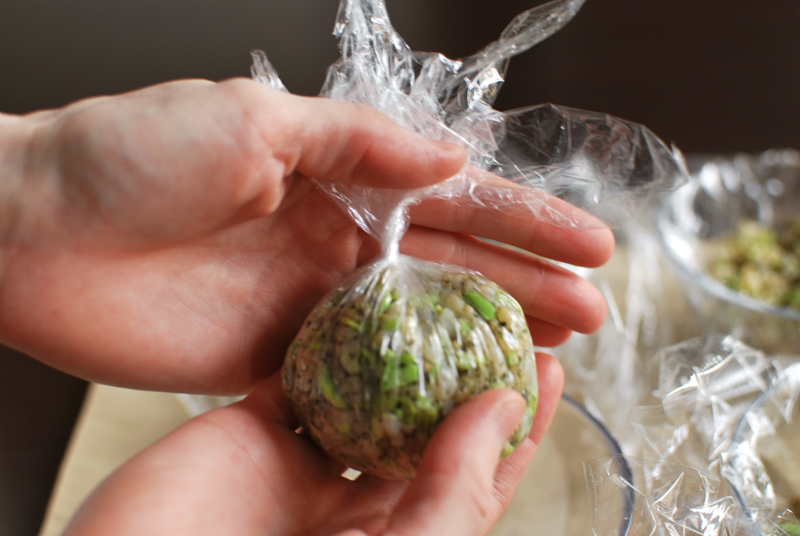 These wrapped-up rice balls can be eaten immediately, or after a few hours at room temperature, or refrigerated for a few days. They also freeze beautifully, which is what mine are doing now. On my way to work in the morning, I grab a couple and leave them at room temperature. By the time I want to eat them, they’re appropriately thawed. If you’re ambitious, wrap a little nori strip around the bottom, just before serving so it doesn’t get too soft. 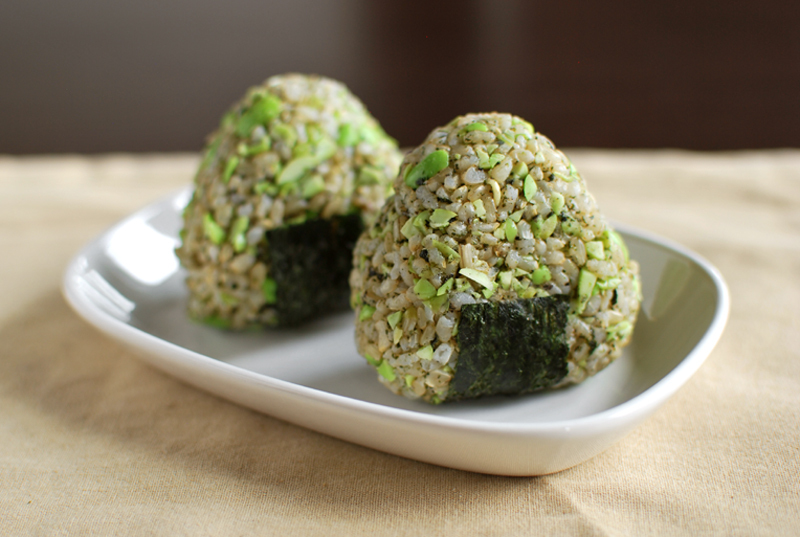 Mine already have nori in them from the furikake, so I only did this for looks. I do not give my onigiri little nori pants at work. This method has never, ever, ever failed me. 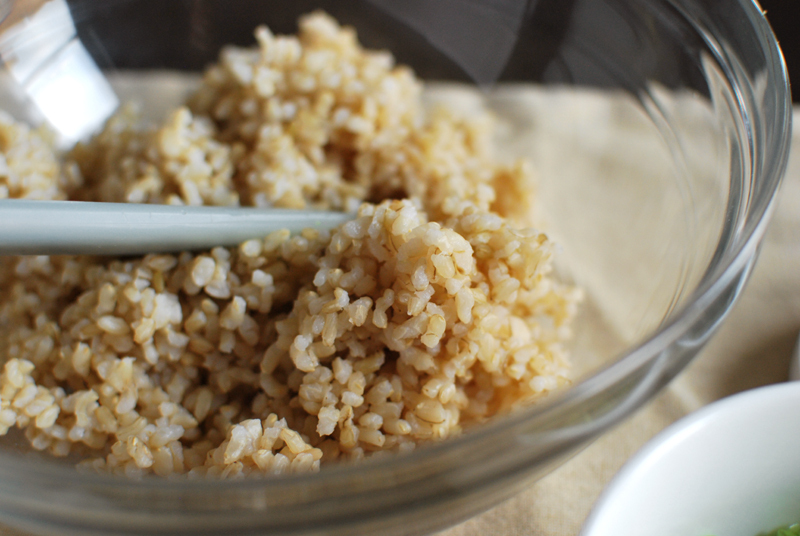 It turns out perfect brown rice, every single time. 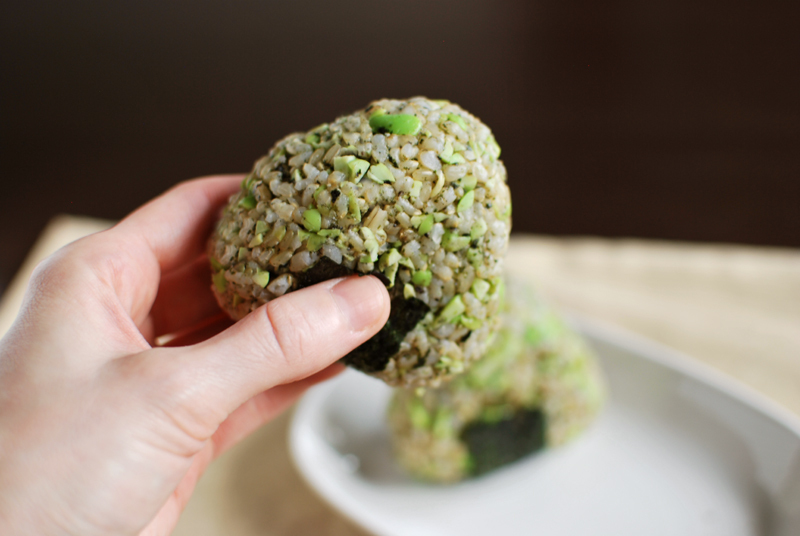 It works for any type of brown rice, but for onigiri, be sure to use short grain rice. Rice labeled as “sushi rice” is ideal. If in doubt, um, look at the grains of rice. If they’re short and round, then you’re good to go. If they’re long and thin, then don’t bother; it won’t be starchy enough to hold together in a ball. If you like, you can add some seasoning other than salt before cooking the rice, such as bay leaf, cumin, sesame seeds, cloves, turmeric, star anise, dried herbs, furikake (recipe below), or even a garlic clove. It will season the rice deeply and aromatically. 1. Turn oven to 375º F. No need to fully preheat, just turn it on. Bring the water to a boil, using whatever method is preferable (microwave, stovetop, whatever; me, I use a tea kettle). 2. While water heats, measure out the rice into a baking dish of suitable size. (Mr. Brown recommends an 8 inch square glass dish, which I happen to have, so that’s what I use. I’m sure ceramic is fine, but maybe not metal, which will heat less evenly and probably crisp the outside edges of the rice.) Add the salt. If your dish doesn’t have a tight-fitting cover, pull out a piece of aluminum foil and fit it to the dish (to make covering it later go quickly and easily), then set the foil aside. 3. When the water boils, pour it over the rice and salt. Give it a little stir, and cover tightly with the foil. (See? If you hadn’t fitted the foil to the dish already, you’d be handling that over a dish full of boiling water. I care about your hands.) Immediately place the dish in the oven, and bake at 375º F for 1 hour. 4. Remove the dish from the oven. I like to let it stand for about 10 minutes before uncovering and fluffing the rice with a fork, both to let the dish cool and to give the rice a little extra steaming time. Cooked rice can be stored in the fridge or freezer. Furikake is really anything you sprinkle over plain rice to season it. It’s usually fairly potent, so a little goes a long way. The nori here doesn’t give a seaweed flavor so much as an umami richness; with the salt, it has a faint brininess that I particularly love with black sesame. Nori can be found in the “international” section of many grocery stores, but Asian markets will have a wider selection. I found some pre-toasted nori that was already cut into strips, for exactly such an application as this. 1. Place the sesame seeds and salt in a spice grinder, or mortar and pestle. 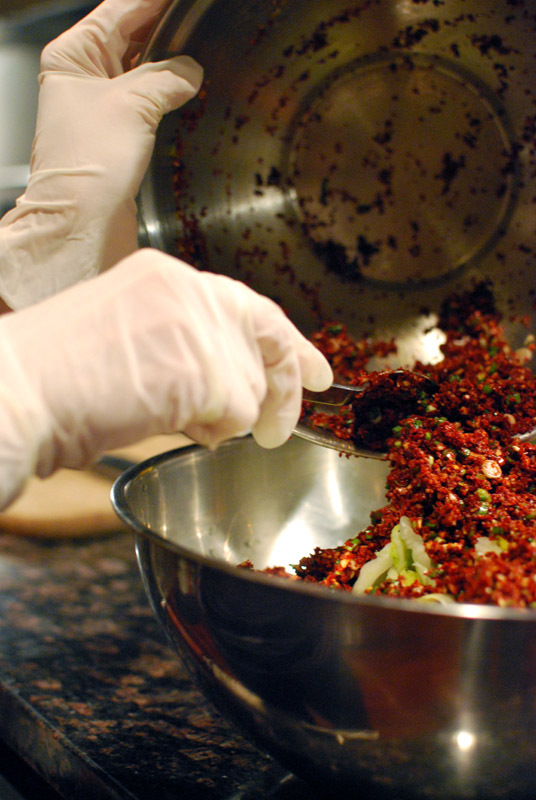 Pulse or grind a few times until the sesame seeds are lightly ground, with some remaining whole. At this point, you can add the nori and grind it all together, or simply mix the ground sesame-salt in with the strips. 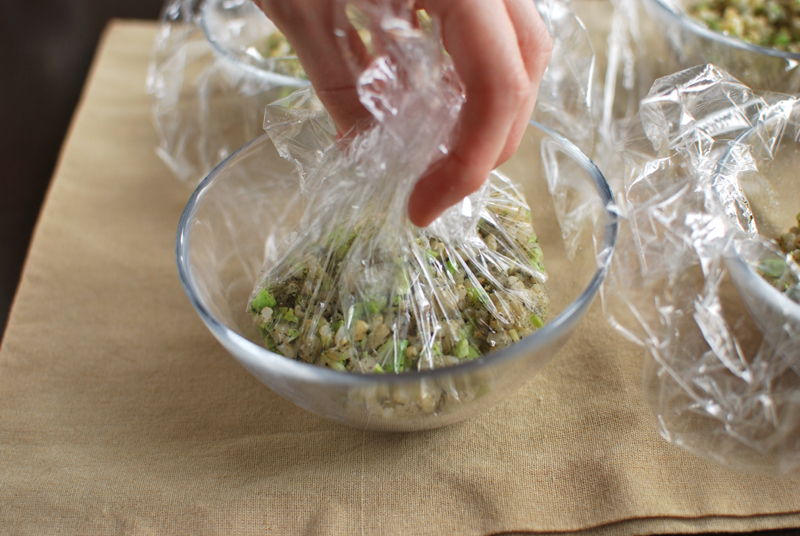 Store in an airtight container in the freezer, or in the fridge if you’ll use it all within a few days. Yes, I’ve posted about kimchi before. But for all its ease, and as much as I enjoy that recipe, that was ersatz kimchi, whipped together in a few hours and not even fermented. Horrors, I know. After a recent wedding in my boyfriend’s family, and the related chance to chat with his charming Korean cousin, I realized that it had been far too long since I’d had a batch of kimchi in my fridge. I also knew that if I didn’t at least attempt a properly-made version, I’d have to explain myself sooner or later. My culinary pride was at stake. One major flaw with my previous go-to recipe was the absence of gochugaru, Korean chili flakes. I had convinced myself that they couldn’t possibly be that much different from standard crushed red pepper flakes, but my heart of hearts knew I was fooling myself. I found a reputable Korean market here in the city, and discovered how wrong I had been. Despite their incarnadine brilliance, gochugaru are far less spicy than the comparatively drab red pepper flakes. And because of this lack of palate-numbing capsaicin, the true flavor of the chilies really shines. The flavor is bright and rich, fruity and robust at the same time. It’s revelatory. Also due to the lower capsaicin levels of these chili flakes, it becomes necessary to use more of them to get a decent level of heat. And by “more”, I mean a lot more. A heckuva lot more. For example, I used 3/4 cup in this recipe, and I think the kimchi could stand to be spicier. This makes it more of a session kimchi, though, one you can eat a whole plate of. It’s not going to burn a hole in your throat if you take more than three bites, like some I’ve enjoyed. Feel free to increase the amount of gochugaru if that’s what you’re going for. Next time, I’ll probably use 1 cup (or more). It might keep me from eating the whole jar, but probably not. Please note: this is a properly fermented food. It will sit on your counter for at least 1 day, and possibly more. This might be off-putting, but if you’re making your own kimchi, you’re probably not that squeamish. Also, any storage container you use needs to be very, very, very clean, to prevent the possibility of strange and unwanted pathogens growing in the cabbage without your consent. Soap and the hottest water you can get are good; a solution of bleach and water is better. 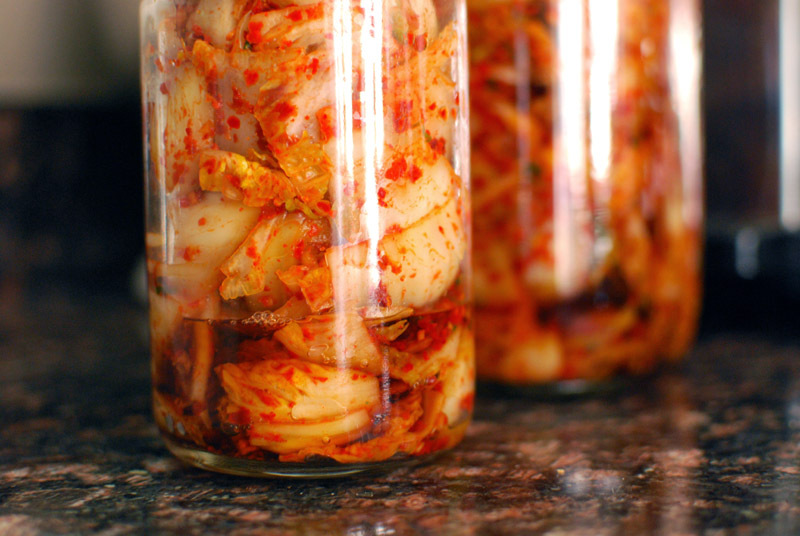 Always use a clean utensil to remove any kimchi from the jar. And take my advice: wear gloves when handling. Otherwise, you’ll probably regret it. This recipe makes more kimchi than most people will ever go through before it gets old; feel free to decrease the size of the recipe. 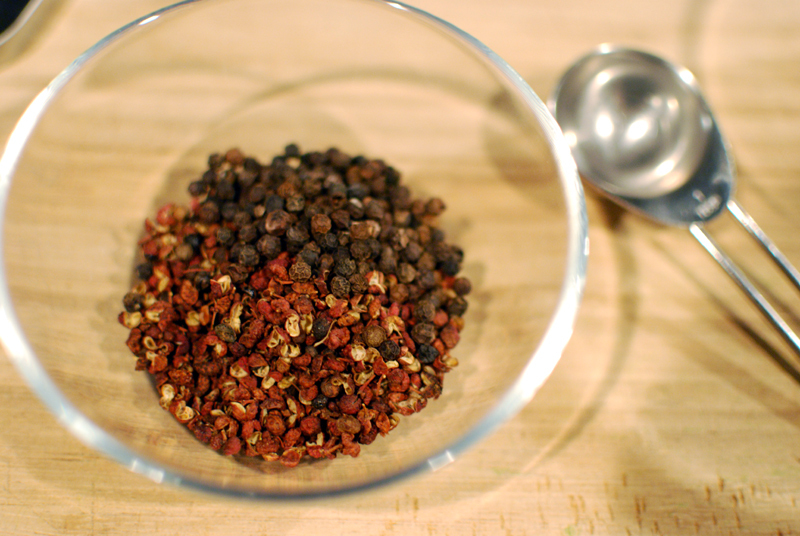 Do not substitute the more common and much hotter crushed red pepper flakes for the less-spicy Korean chili flakes. 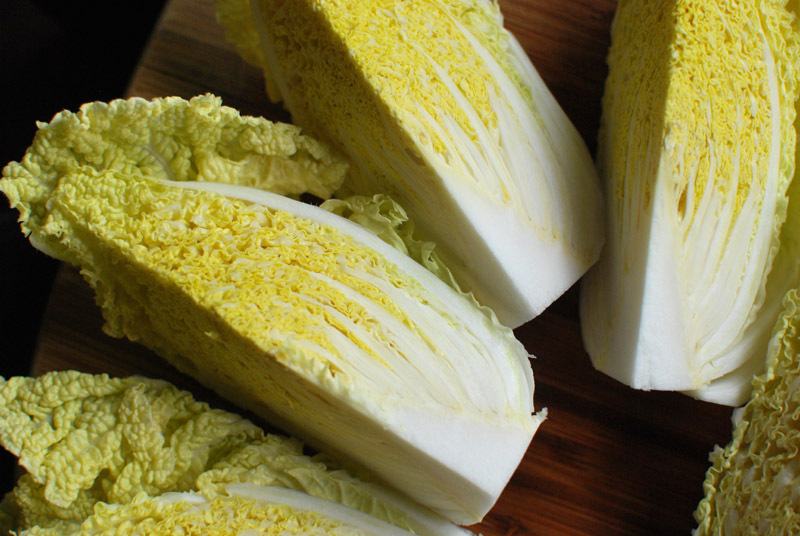 If you can’t find gochugaru, but still want to make kimchi, try this recipe. For storage, be sure to use a glass canning jar, one with a rubber gasket, unless you want your entire fridge and the food therein to smell like fermented spicy cabbage. Plastic is of no use here. And make sure it is scrupulously clean. 1. In a pan, bring the salt and 1 quart water to a boil, stirring to dissolve the salt. Remove from heat and add 1 quart ice water. This should quickly cool down the salt water to about room temperature. 2. Meanwhile, thoroughly wash the cabbage. 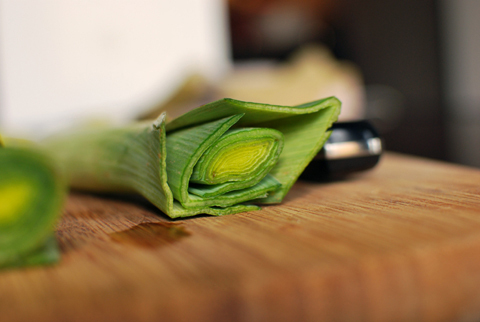 Cut it lengthwise into quarters, and cut away the stem so that the leaves will separate. Cut crossways into 1 to 2 inch strips, and put in a very large, non-reactive bowl. Cover with the cooled salt water, placing a plate on top to help keep the cabbage submerged if necessary. Let stand at room temperature for 3 to 5 hours. 3. 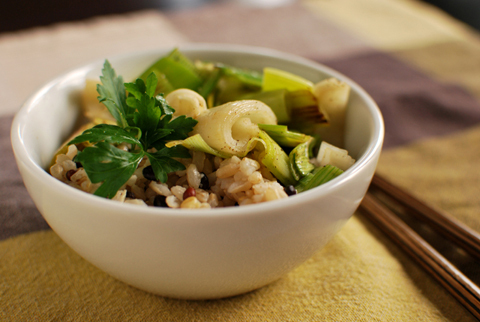 While cabbage soaks, prepare remaining ingredients and combine together in a non-reactive bowl. 4. After 3 to 5 hours, drain cabbage and rinse thoroughly. Squeeze dry, and return to the large bowl. 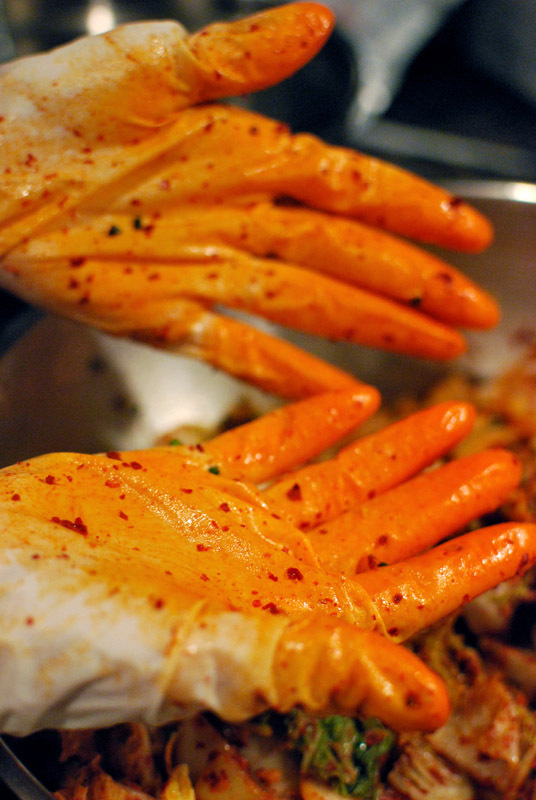 Toss with the other ingredients until evenly combined, being sure to wear gloves if using hands. 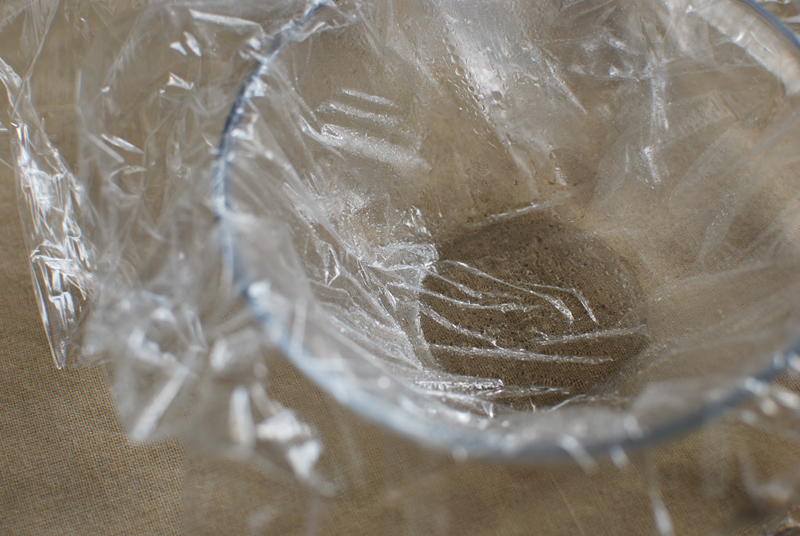 Transfer to a scrupulously clean glass jar (or jars), and cover with a very tight-fitting lid. Let stand at room temperature for at least 24 hours, and up to several days. You’ll notice some liquid forming in the jar, and maybe some bubbling. This is okay. 5. 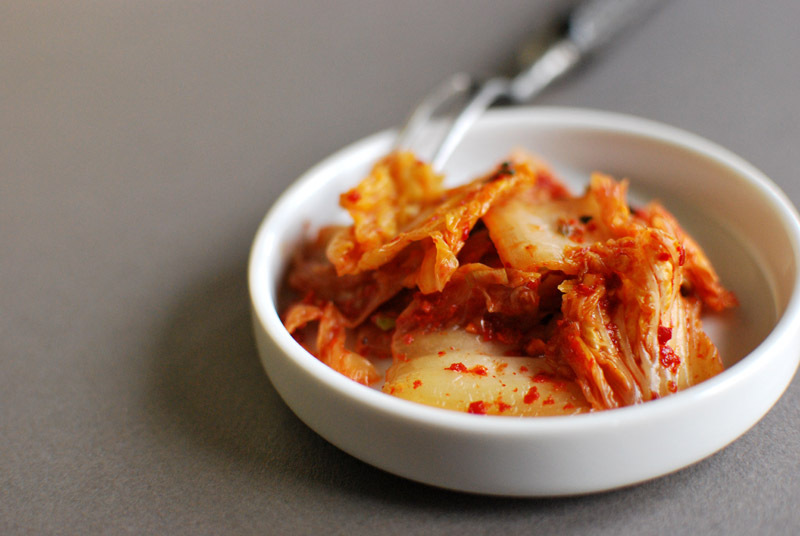 Taste the kimchi after 24 hours, using a clean fork to remove it from the jar. If you like the flavor, transfer it to the fridge at once; if you’d like a bit more funky depth, let it stay at room temperature, tasting occasionally, until you like the way it tastes. 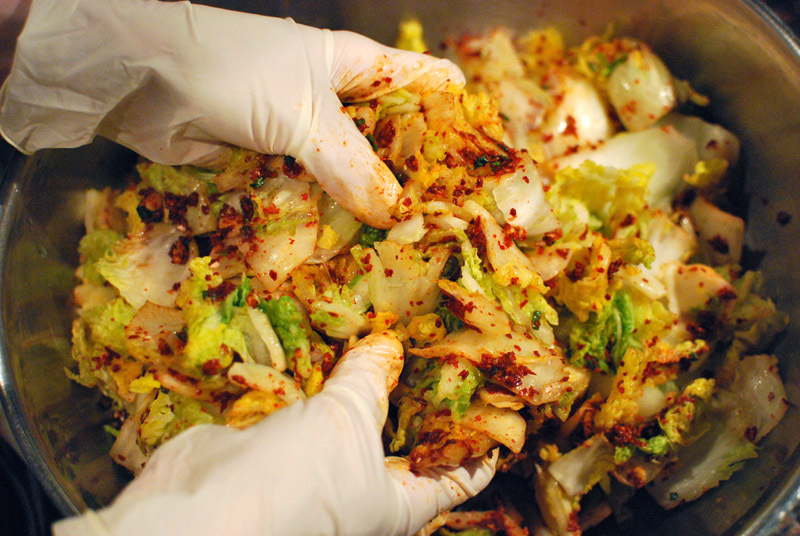 Kimchi will keep indefinitely under refrigeration, but loses its edge after 3 to 4 weeks. 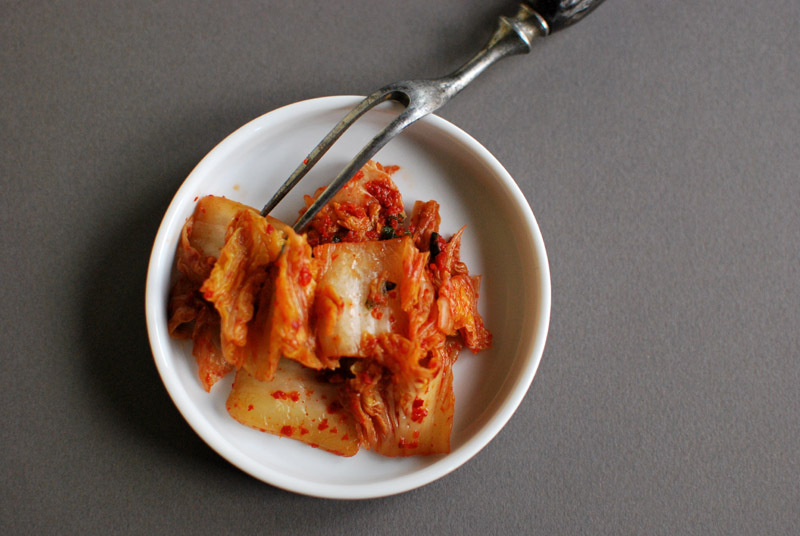 That “old” kimchi is best used for soups, stir fries, and pancakes.